March 2, I visited SV Meppen - Wehen Wiesbaden in 3.Bundesliga just across the border with the Netherlands. 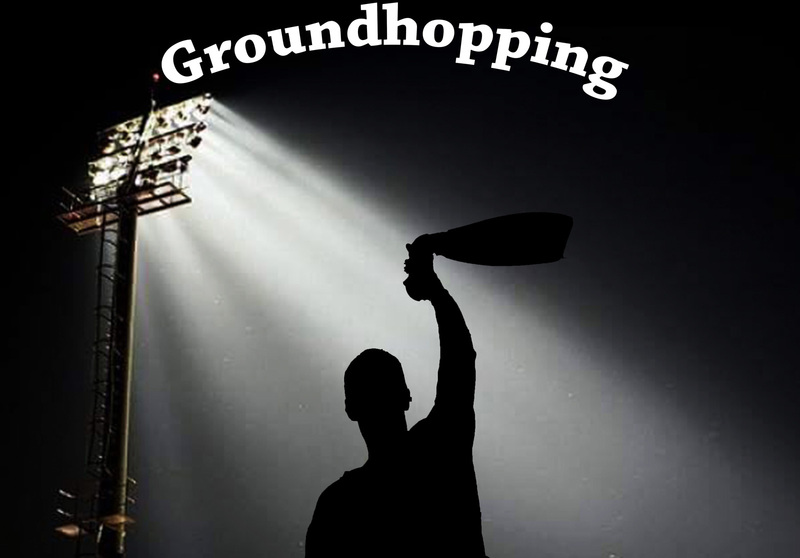 Beautifull ground with four different stands and a good atmosphere also because of a high beer and bratwurst consumption. 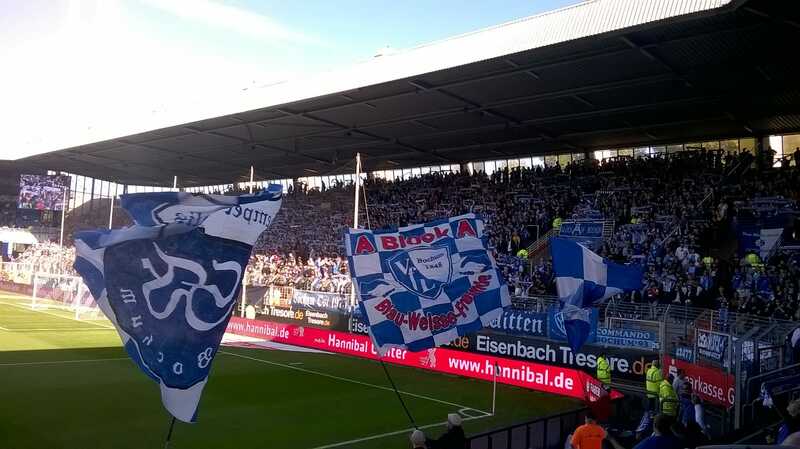 Just before the match I was suprised by a big banner covering one of the stands and like everywhere in Germany the Meppen fans do understand that the real fan is wearing a scarf. In the north of Norway , above the Arctic circle is a professional football club called Alta I.F. The club is playing the home games in an indoor stadium. Alta is the first club in the collection located above the Arctic circle. In March I exchanged some scarves with Chelsea fan Josh Chunn. Thanks to him I could add a new Watford scarf to the collection. The Ultra-side of F.C. Utrecht is known as Bunnik Side. Bunnik is the name of a small village south of Utrecht. Besides Bunnik Side there are three other stands in the Galgenwaard. City Side, Noord Tribune and Zuidtribune. The orginal name of the Bunnik Side was Bunnik zijde. Because of the bad reputation of the Bunnik zijde the major of Bunnik forced the club in the early seventies to change the name. F.C. Utrecht decided to change the name in East Side. See scarve below added to the collection by Steve Uiterwaal. However, the fans did not accept the change and and forced the club to use the old name again which was translated later in englisch to Bunnik Side. 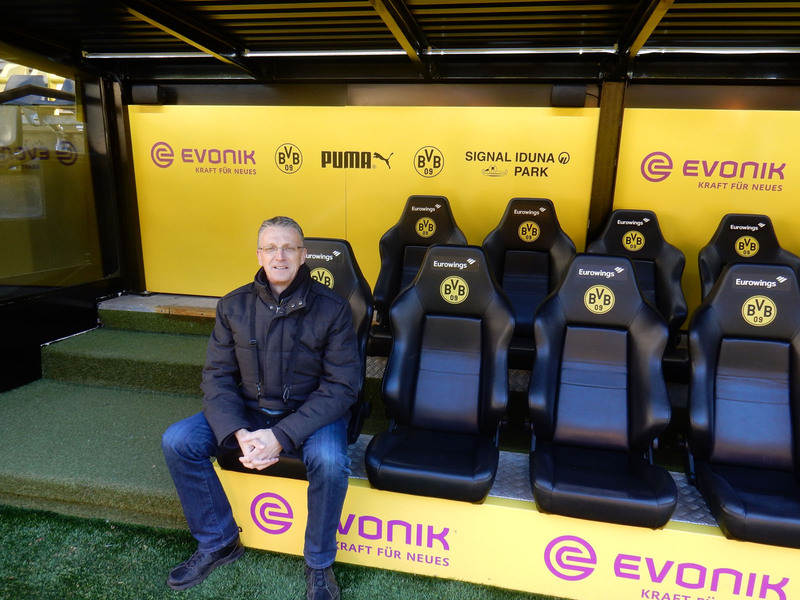 In February I visited together with old colleagues the Westfalen stadium in Dortmund and the match Schalke - Freiburg. The tour in the Borussia Dortmund stadium was nice. Access to the clothing rooms, facilities and stands. Similar to the big clubs in Europe, the merchandising has been grown considerably over the last years. At the end of the tour I got a beautifull Mega BvB scarf from the colleagues. 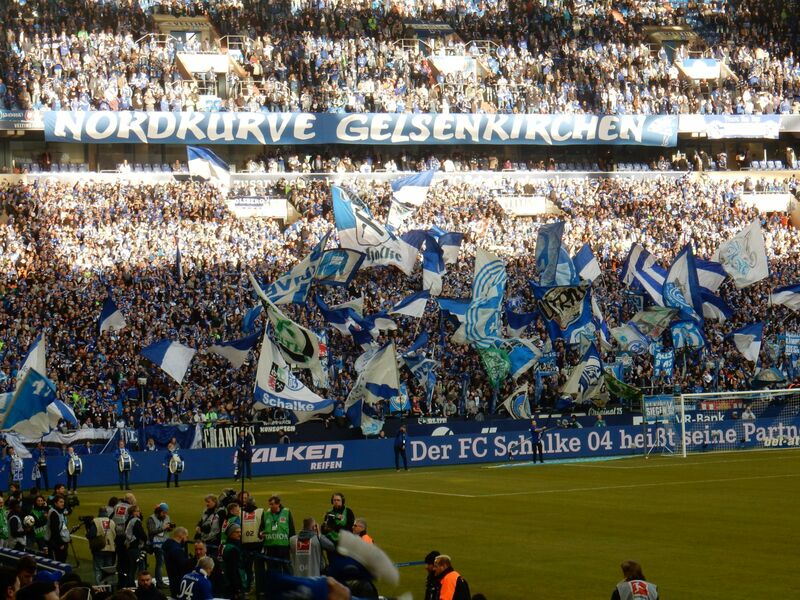 Schalke 04 has this year the worst team in years but their fans are still loyal to the team and club. With United fan Andy Henly I exchanged a F.C. Utrecht scarf for a Forfar Athletic scarf. Like most of the scarves in the collection there is a story behind this scarf. Andy visited the ground of Forfar and the only full time member of the staff , Martin , the groundsman, gave Andy and his wife a tour together with his dog...He did show them the dressing room, store room, board room and they made a walk on the pitch. No wonder Forfar is now in the heart of Andy. Four members of Scarf Collectors Holland visited Poland and Czech in November 2018. One of the matches they visited was Slezsky Opava - Banik Ostrava. I could not join but Jelmer Boots had a nice present for me when they were back in the Netherlands. F.C. Utrecht is selling 5 different scarves this season. One of them is not only showing the club logo but also the Dom tower of Utrecht , with 112 m the biggest church tower in the Netherlands. Colleague Katrin Keilich added a very special scarf to the collection. The Energie Cottbus scarf is showing the club logo but is also referring to the company where we working for ; Vattenfall, sponsor of Energie Cottbus when the company was operating lignite mines in the Lausitz area in Germany. Thanks to David Alonso, scarves of all clubs of the Spanish Primera division are in the collection now. A scarf of SD Huesca was missing and David was able to get it. This month I could exchange some scarves with Flavien Oroy again. A country scarf of Nigeria is in the collection now. My son Kevin did visit Rome this month and brought some souvenirs with him ; scarves of both AS Roma and Lazio. At the footballcollectors fair in Houten, the owner of Antykwariatsportowy.pl from Poland did offer some scarves and I was able to add a scarf of Universitatea Cluj to the collection. Saturday October 6 there was another football collectors fair in Houten in the Netherlands. Thanks to Wim and Kris , the well known Belgium collectors of all kind of football items, I could add some club scarves of Belgium clubs and a country scarf of South Korea to the collection. September 6, Wesley Sneijder did play his last game for the Dutch team. The Dutch team did beat Peru with 2-1. Besides the match scarves I could add a special player scarf to the collection. Valladolid, club of colleague football scarf collector David Alonso, is playing in the Primera Division again. 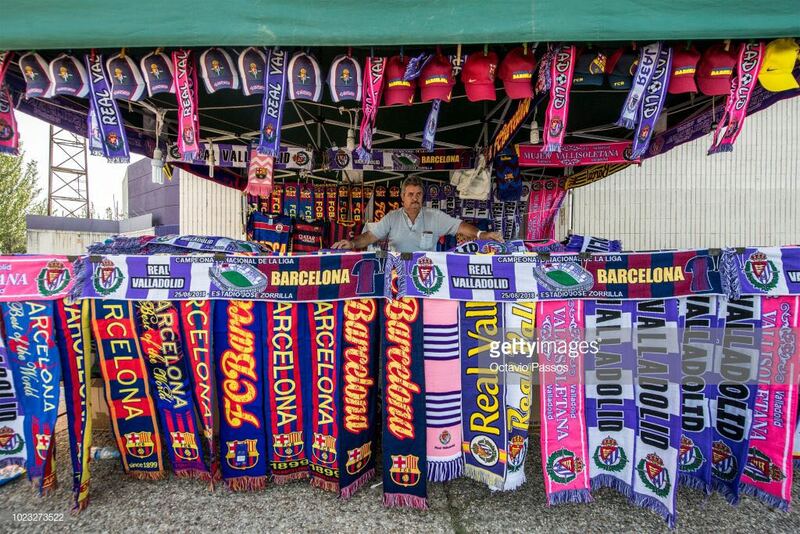 Before the game against Barcelona fans had a lot of choice when they wanted to buy a scarf. Colleague Hans Koens was a die-hard fan of HFC Haarlem and added his club scarf to the collection. HFC Haarlem was a Dutch football club from the city of Haarlem, established in 1889 and dissolved in 2010. The club won the Dutch national title in 1946 and reached five Cup finals, winning in 1902 and 1912. Haarlem reached the second round of the 1982/83 UEFA Cup, losing to Spartak Moscow of the Soviet Union. Haarlem was declared bankrupt on January 25, 2010, and excluded from professional football with immediate effect. During my holiday I visited 1.FC Lokomotive Leipzig - ZFC Meuselwitz (3-0) in the Regional Liga Nord-Ost, the fourth level in Germany. 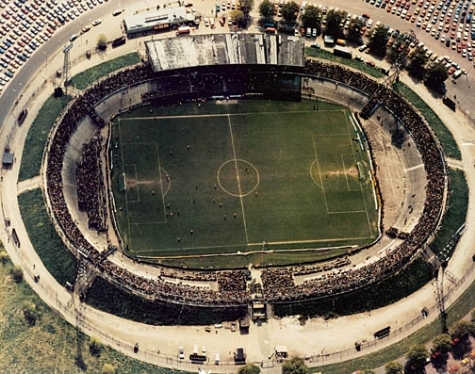 Lok Leipzig is playing in the Bruno Plache Stadion, das Bruno. 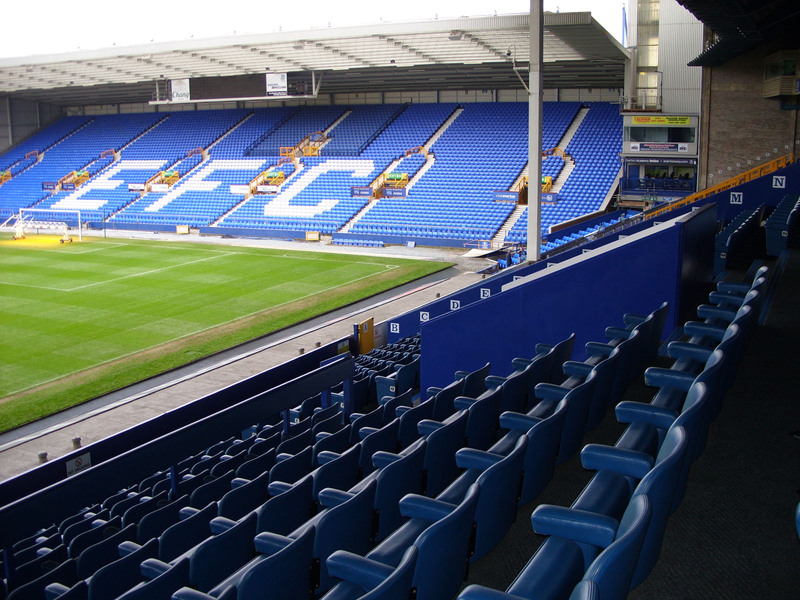 The stadium has been build in 1922 and the main stand is constructed of wood and still in original state. 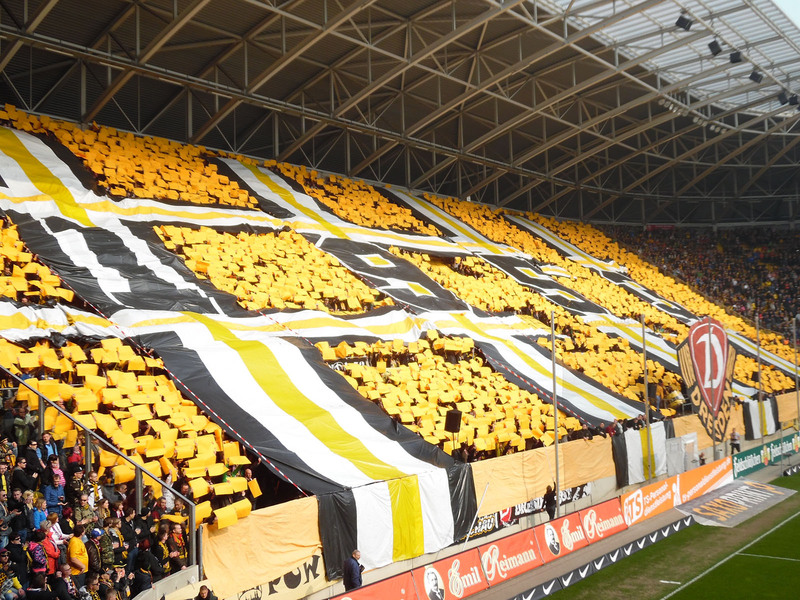 Lok Leipzig is totally different from Modern Football club RB Leipzig(playing in the Bundesliga),has an average attendance of 3.000 people and is a real cult club. Thanks to David Alonso I could add a scarf of Banik Ostrava to the collection and thanks to Jelmer Boots there is second club scarf from Slovenia in the collection. In May, I visited the Copa store in Amsterdam. Copa was founded in 1998 when a football addict started with a small collection of traditionally produced heavy weight cotton football shirts Nowadays the collection consists of different lines with retro shirts and football inspired T-shirts and sweaters. Now they have also a scarf for sale. In May we visited Alkmaar and the Almaarse Gift and Football shop. In this shop you can buy scarves of many football clubs. I added a special Zenith scarf to the collection. In March I visited NEC - Telstar in the Dutch second league. NEC Nijmegen has a small stadium located in the Goffert Park, fanatic but critical fans and even the good end score (3-0) could not make them happy. Both teams will play in play-offs for promotion to the Eredivisie. April 11, I visited BFC Dynamo Berlin - Oberlausitz Neugersdorf (1-1), a match in Regional Liga Nordost, the fourth level in Germany. Dynamo is second in the league after Energie Cottbus who as champion still needs to play play-offs for promotion to Bundesliga 3 at the end of the season. 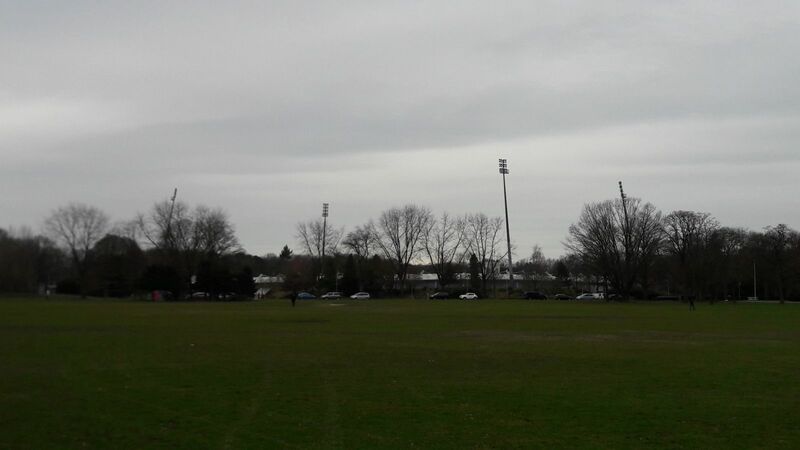 Dynamo is playing their home matches in the Friedrich-Ludwig-Jahn-Sportpark in Prenzlauer Berg. Dynamo won 10 times the DDR championship between 1979 and 1988. As the name suggests the club was in the past the club for the police and was supported by the Stasi. Their biggest rival is still Union Berlin, with an anti-stasi and a fanfriendly reputation. With 1,300 visitors, nothing on stake and no fans of Oberlausitz the match was like a friendly match. No matter you like the club or dislike it , Dynamo is a cult-club and you can buy a lot of merchandising at the stadium expressing the 'everybody hates us and we like it' feeling. April 14, I made a German-Belgium trip with scarf collector Marco Remeijnse. In the afternoon we saw Bayer Leverkusen - Eintracht Frankfurt (4-1) and in the evening Standard Luik - AA Gent (1-0). 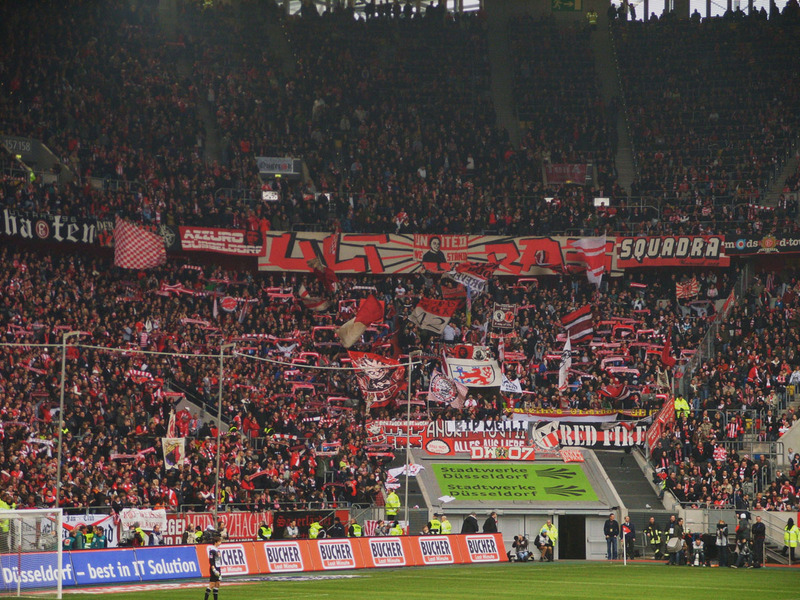 Impressive was the number of Eintracht fans in the stadium. 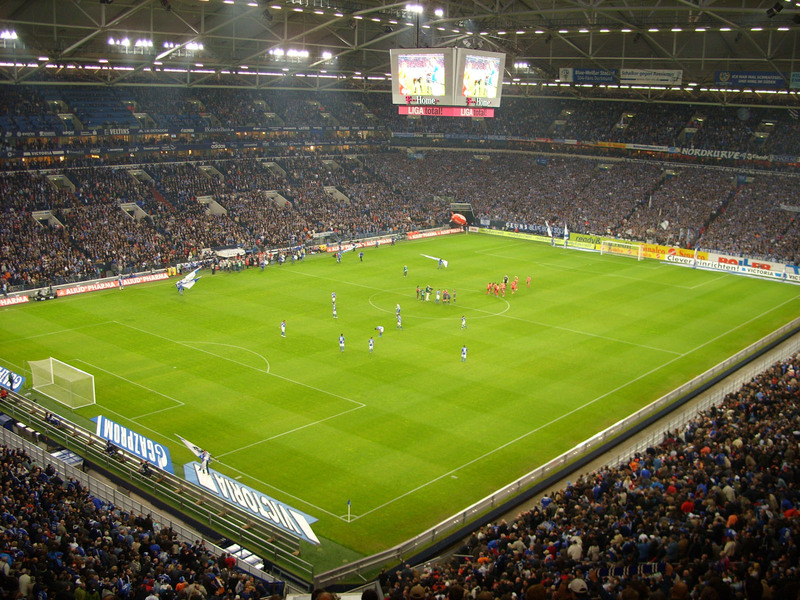 Leverkusen is playing in a new modern 'Arena' , is a friendly club but missing some 'football culture'. A club which is breathing 'foootball culture' in all perspectives is Standard Luik , around and in the stadium you could feel the passion for the club. Impressive to experience the support from all stands and the different Ultra-groups. Thanks to Flavien Oroy I could add three new country scarves to the collection, Cape Verde, Senegal and Sao Tome and Principe. 10 December 2017 , the match F.C. Utrecht - Feyenoord was scheduled but due to weather circumstances the match was cancelled and played in January. On 10 December 10, Vice - president of the F.C. Utrecht fanclub Siege Postuma organised a Marines - day in stadium Galgenwaard and gave all guests a match scarf. Thanks to Steve Uiterwaal this special scarf is also in the collection now. My son Kevin visited Krakow in Poland and gave me as souvenir a Cracovia scarf. At the football collectors fair in Houten Kris and Wim from Belgium were present and thanks to them I could add a special Olympique Lyon scarf to the collection. In December colleague collector Marco Remijnse gave me the chance to add scarves of different clubs to the collection. 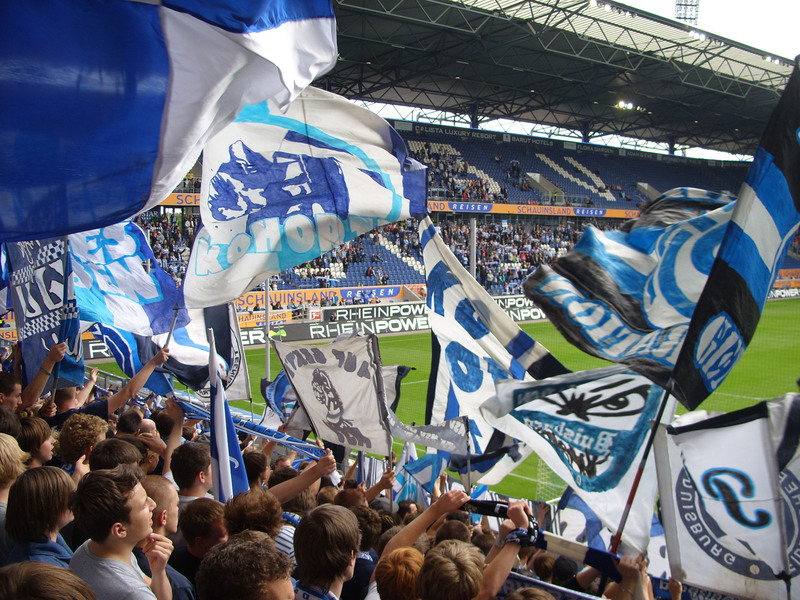 Besides scarves of the German Bundesliga clubs, al lot of scarves have been added of clubs playing in the third Bundesliga and Regional liga like Sonnenhof Grossaspach, Unterhaching, Kasseler SV, Koblenz, Westfalia Herne and Wormatia 08. Also some scarves of clubs from Belgium have been addded to the collection, among them Groen Rood Katelijne, Zwarte Leeuw and Olympia Wijgmaal. Colleague Hugo has lived for a long time in Australia. The national team of Australia are called 'the Socceroos'. Hugo added the Socceroos scarf to the collection. 32 years ago, my club F.C. Utrecht played against Dynamo Kiev in the Europan Cup for cupwinners. in that season Dynamo Kiev won the cup and lost only one match in the tournament, against F.C. Utrecht. ( 0-1 in stadium Galgenwaard, 18 September 1985).Thanks to Jelmer Boots, the scarf is finally in the collection. The first weekend of November three other members of the Scarf Collectors Holland and me did visit some matches in Italy. 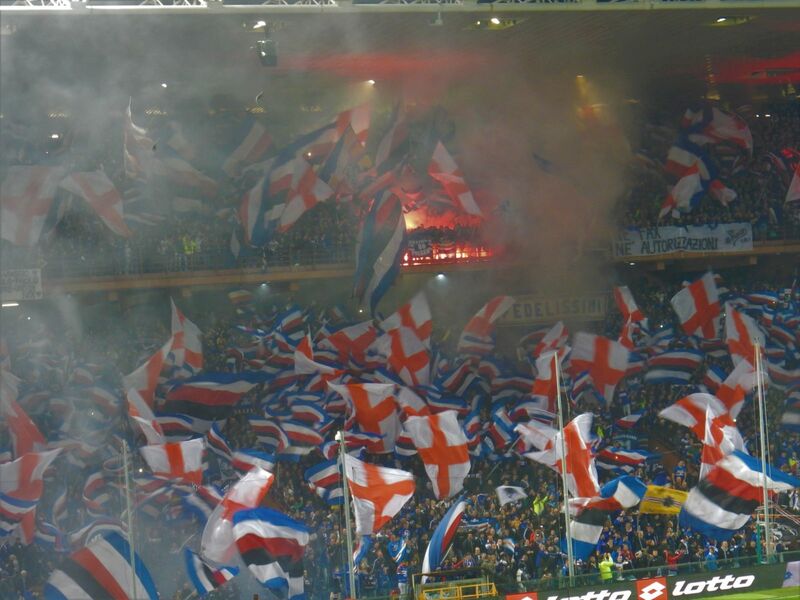 We started with the Serie B derby Novara - Pro Vercelli (0-1) at Saturday afternoon and after that match we drove to Genua for 'IL Derby Della Lanterna', Genoa - Sampdoria (0-2), the most intense Derby in Italy . Stadium sold out, noise, flaring, beautifull singing and a match full of passion. Even 30 minutes after the match the two curva's continued the battle by singing their songs. 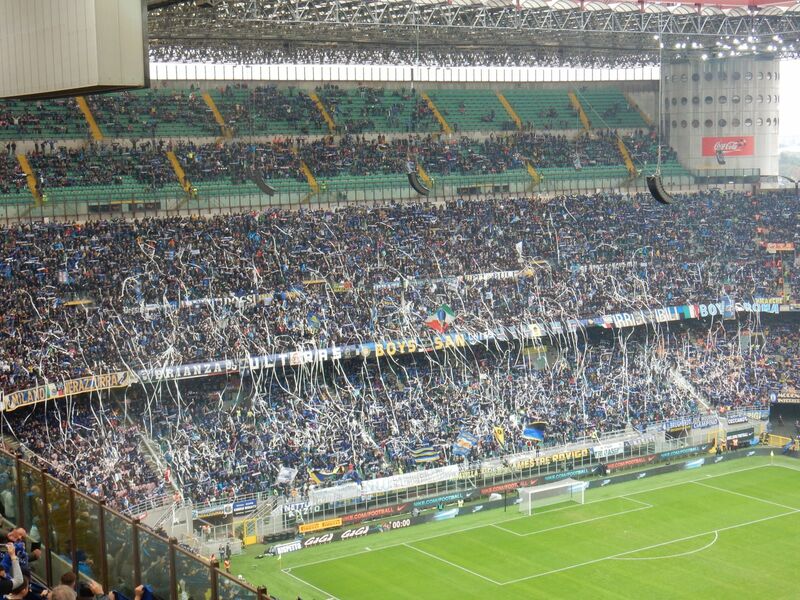 The next day we drove to Milan for the match Inter - Torino (1-1). Impressive stadium with a beautfull view on the city from our seats. Inter is still a big club In Europe with 72.000 people coming from all over the place watching this game and impressive merchandising outside the stadium. Sunday evening we visited Atalanta - SPAL (1-1), heavy rain in the open air for 90 minutes and a very old stadium. But that could not stop the fans supporting their teams. It was great to experience a new football culture and to be able to visit 4 matches in 36 hours.. We were also able to buy some scarves. Especially the Derby scarf is great to have in the collection. 25 September, I finally got the chance to visit an Union Berlin match. That day they played against Kaiserslautern. 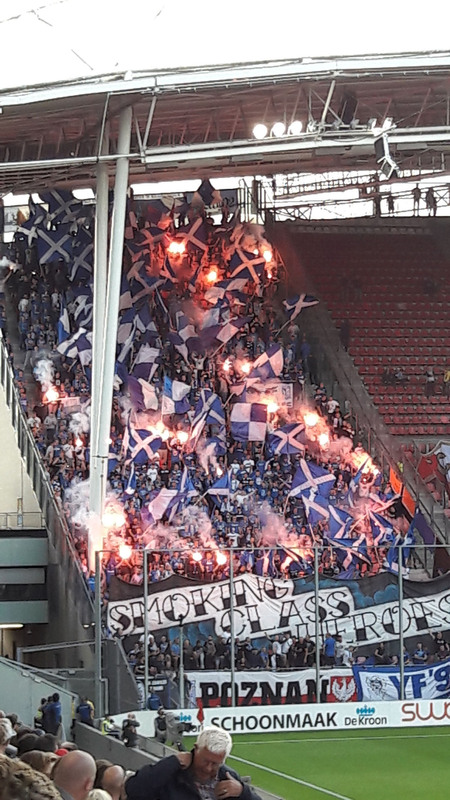 The atmosphere around and in the stadium was great, not only because of the result ( 5 - 0 ) and the fact that all tickets were sold out, but also because three of the 4 stands of the Alten Forsterei have no seats and all Union fans are wearing and using their club scarf and are singing their hearts out. Thanks to Claudio Merello, some old Sampdoria scarves have been added to the collection. One of them was an old Ultra scarf of Caterina Mura. Beginning of October I visited the footballcollectors fair in Houten together with Steve Uiterwaal. Scarves of Zorya Luhansk, Besiktas, Rijeka, F.C. Utrecht, Feyenoord, Finland , AS Roma and a very special friendship scarf of Ultra Sur (Ultra's Real Madrid) and Brigadas (Espanyol) are in the collection now. In October, I made a Belgium-Germany-Holland football trip with old colleagues. We started in Belgium with KV Mechelen - Anderlecht , and the next day we saw Bochum - Sandhausen and F.C. Utrecht - Heerenveen. Nice trip, good weather, special beer in Belgium, Bratwurst in Germany, a lot of goals and interesting to see the different football styles and fan cultures. After beating Lech Poznan FC Utrecht were playing in August against Zenit St.Petersburg for the Europe League.After 7 years the club could issue a match scarf for an European match again. Dutch scarf collector Jelmer Boots and me did exchange scarves with Edgars Zakis. As a result the second clubscarf of a club from Latvia has been added to the collection, FK Jelgava. A football scarf collector from Cyprus has designed an Around the World scarf collectors scarf with the logos of scarfcollectors Holland, Romania, Israel, Germany, Indonesia, Poland and Cyprus. In July FC Utrecht did play qualification matches for the European League. First match was away to Valletta FC on Malta. Bad pitch, high temperature (31 degrees during the match) and sad news about Ajax player Nouri resulted in a disappointing match (0 - 0). But thanks to a 3-1 victory in the return match, we are in the next round. I visited both matches and during the day on Malta I visited the beautifull city of Valletta. In one souvenirshop I could buy a scarf of Valletta FC but in a football souvenir I could also buy scarves of other clubs from Malta : Birkirkara, Floriana, Gzira United, Hamrun Spartans, Sliema Wanderers and a Valletta FC Ultra scarf. Two weeks later FC Utrecht did play against Lech Poznan in the next round. Also this game was disappointing, another 0-0.. Highlight of the evening was the flaring of the Polish fans. May 17, Steve Uiterwaal and me visited the football collectors fair in Velsen, which is twice a year taking place in the Telstar stadium. Most of the people offering pins, badges, scarves, shirts, programmas , books etc. are also present at the fair in Houten which is also organised twice a year. Besides some banners from the sixties and pins for my 'scarves room' I was able to add some scarves to the collection thanks to FC Utrecht collector Marcel van Wolferen. One of them was a vintage scarf of IJsselmeervogels. Also some club scarves of other dutch third division clubs have been added to the collection : HHC Hardenberg, Rijnsburgse boys and Katwijk. Colleague and Ajax - fan Marco Scheurwater did visit the European Cup fInal in May. Disappointing result but nobody expected that a dutch club could make it to the final in today's football world. I am not a fan of Ajax, Real Madrid and the Spurs and I you are asking me what is your favorite football player, the answer will not be Rafael van der Vaart. But the scarf Steve Uiterwaal could get in a bazar is very special. The logos are woven and the picture is printed. May 9 , the Scarf Collectors Holland were on tour again. We visited Wuppertal - Bonner SC in the afternoon and Waasland Beveren - Lierse SK in the evening. We are fans of six different dutch clubs, not that easy to find a suitable date but today most of the members were present. 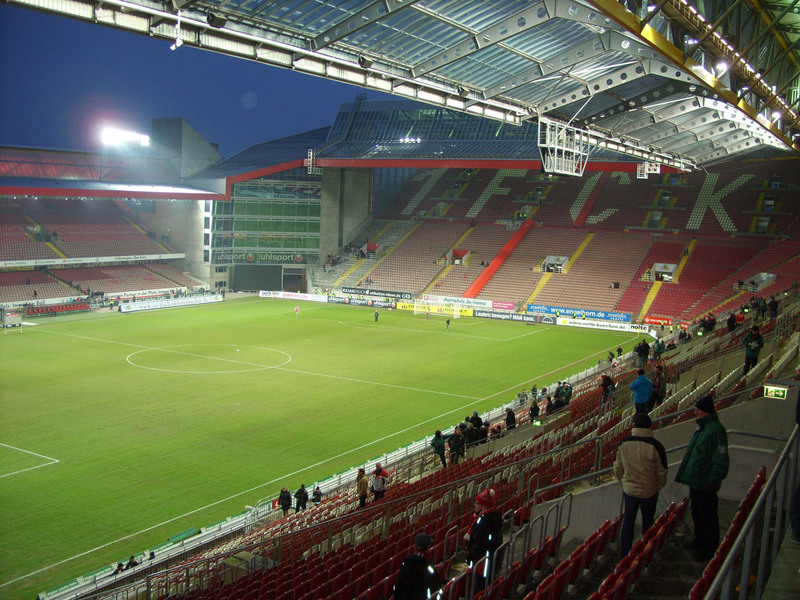 Our first trip in 2011 was to Wuppertal as well and it was good to be back at the Stadion am Zoo. Good weather, good food and beer and a good atmosphere with a lot of families present. Contrary to last time , there were different scarves for sale so most of us added one to their collection. Wuppertal has a fanatic Ultra-group and like every Ultra- group they like it to show that they dislike it that pictures are taken from them but in fact they like it... More about trips : see tab Scarf Collectors Holland. In May, thanks to Jelle de Munck and Douwe Schouwenaars I could also add some special scarves to my collection of Aguilas America (Mexico) , Millwall, Kidderminster Harriers, Rot-Weiss Erfurt, and Portsmouth. 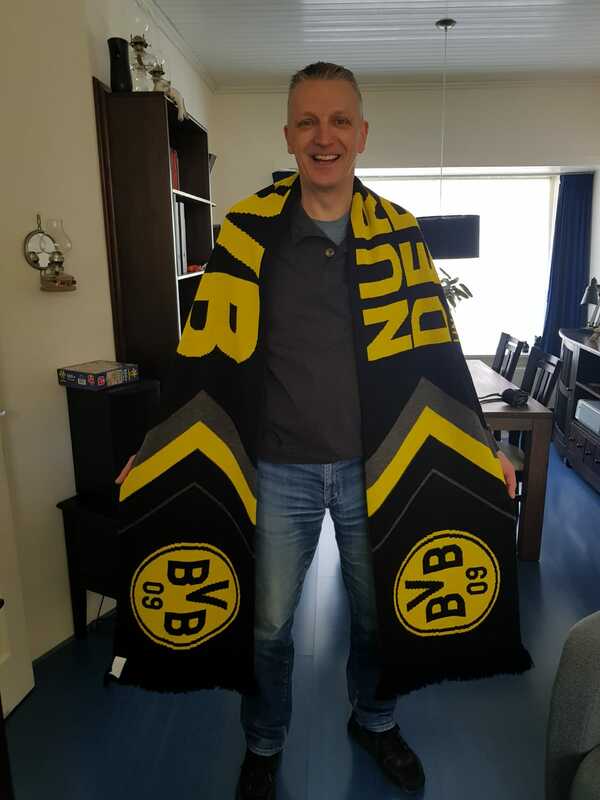 Colleague and AZ fan Henk Reijenga visited the Dutch Cupfinal AZ - Vitesse,had a great day despite the defeat and added the match scarf to the collection. The son of law of my colleague Fred Herberich is Mark de Vries, striker of many clubs in the Netherland ( ADO Den Haag, FC Dordrecht, Cambuur) , Scotland (Hearts) and Engeland (Leicester). He is now working as trainer on the Faroer Islands. He did add a scarf of Tvoroyrar Boltfelag to the collection. Beginning of April my brother in law Jan Smit and me made a trip to Madrid and Barcelona. 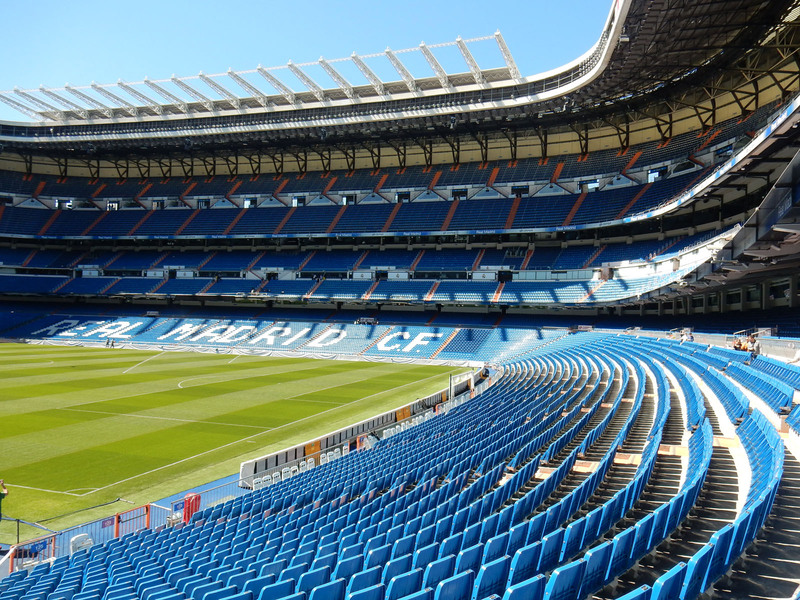 We visited the stadiums and musea of Real Madrid , Atletico Madrid and Barcelona and saw two matches : Atletico Madrid - Real Sociedad and Barcelona - Sevilla. Impressive stadiums, matches and scarf culture ; club scarfs , player scarfs , match scarfs, stadium scarfs and anti-scarfs. 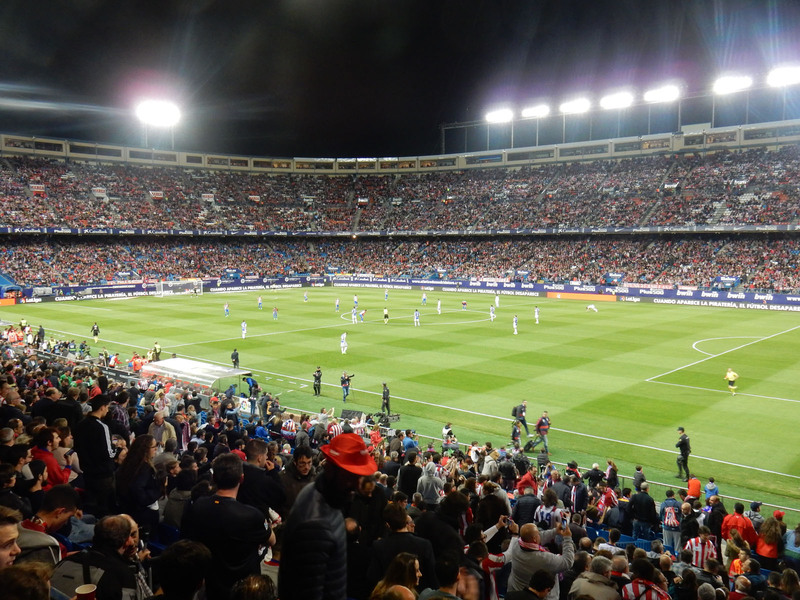 The atmosphere in Vicente Calderon was great, a fanatic crowd who supported their team the whole match. 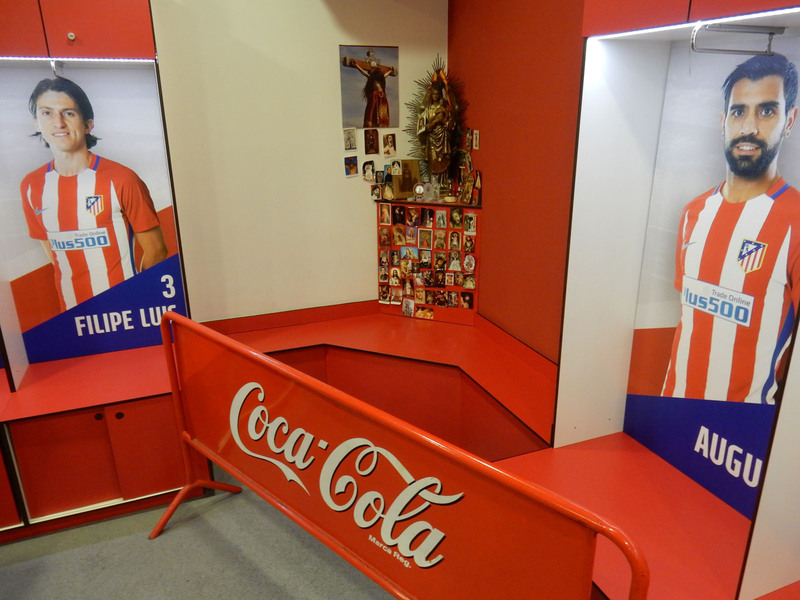 During the tour in the stadium we saw something remarkable in corner of the the Atletico dressing room which I have never seen in a dressing room sofar : a little altar. During out trip we noticed that 'Football Culture' is still existing and can be experienced at Atletico. Hopefully the club will not lose this when they are moving to a new stadium next year. 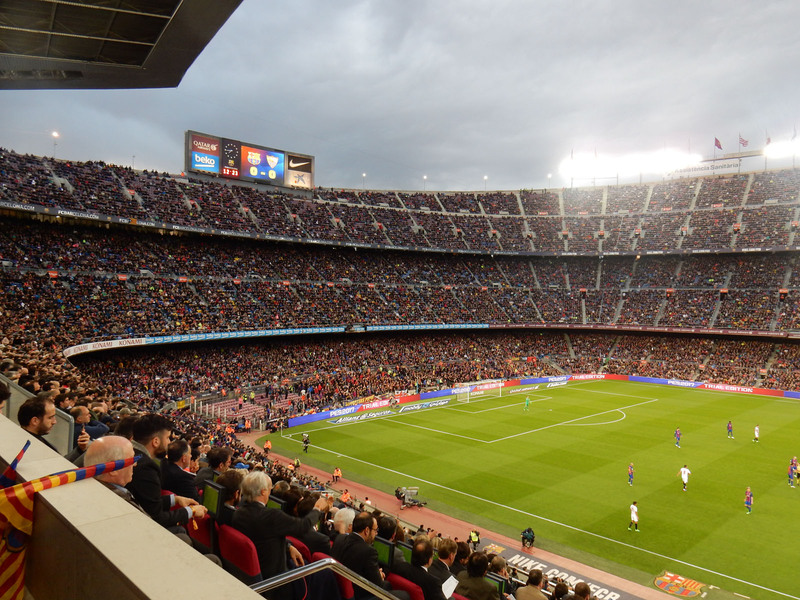 At Real and Barcelona we saw that big clubs in Europe are not only football clubs but also companies which are developing and exploting a brand. Getting scarves from the big clubs in Spain is not that difficult , which is not the case for club scarves of clubs from Segunda Division A and B. Thanks to David Alonso I could add scarves of Alcorcon, Cartagena, Girona , Logrones and Mirandes to the collection. The biggest fanclub of FC Utrecht did issue a new scarf as well. This fanclub organised a boattrip for their members to Rotterdam when FC Utrecht did play against Feyenoord in the cup-final. The members got a special woven scarf and Steve Uiterwaal managed to get one and now it is part of the collection. There are now 213 FC Utrecht scarves in the collection giving a special overview of the history of the club from 1970 untill now. The biggest scarf collector in the Netherlands, the driving force behind Scarf Collectors Holland and fanatic ground hopper Jelmer Boots has now more than 2800 scarves in his collection. He has a huge network in the world and because he is only collecting double sided woolen scarves, I have sometimes the opportunity to add some scarves to my collection he is getting from other collectors. Last month I could add Cloppenburg, Lubeck, Saarbrucken, Wehen Wiesbaden, Barnet, Arezzo, Johor Darul Takzim (Malaysia), Ferroviario da Beira (Mocambique), Aves, Estoril, Moreirense, Uniao da Madeira , Otelul Galati (Romania) and Rotor Volgograd to the collection. My son in law Frank visited Borussia Monchengladbach - Mainz with his father and brother and bought me a bar-scarf of BMG. Scarves from different countries have been added by Steve Uiterwaal like Aris Salonika, Ruch Chorzow, Fulham, Union Berlin, KAS Eupen, Germinal Beerschot, Rijeka, AS Roma and Panatinaikos. Thanks to David Alonso, all the clubs of the Primera Division are in the collection. 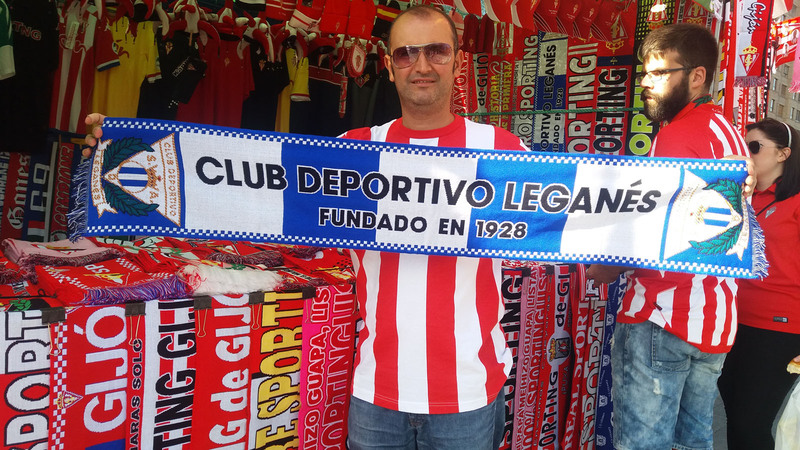 Besides Leganes, scarves of UCAM Murcia , Lugo and Llagostera have been added to the collection. My son Kevin visited Colombia in November and bought some scarves in Medellin and Bogota. In Bogota he was able to buy scarves of Santa Fe and Millonarios. In Medellin scarves of 2016 Copa Libertadores winners Atletico Nacional and Deportivo Independiente. One week later the Brazilian club Chapecoense were on their way to Colombia to play Atletico Nacional in the first leg of the Copa Sudamericana final when their plane crashed. The following day, Atletico Nacional said that they would not ask Chapecoense to play the final. “After worrying about the human aspect, we thought about the competitive aspect and we want to publish this statement in which Atletico Nacional asks CONMEBOL to present the title for the Copa Sudamericana to Chapecoense to honor their big loss and as a posthumous honor to the victims of the fatal accident that our sport mourns,” Atletico Nacional said in a statement. There are two new county scarves in the collection , Benin added by Steve Uiterwaal and Macedonia , added by Jelmer Boots. Beginning December Bald Menges and I had a super sport weekend with visting Ice Hockey , Handball and football games. 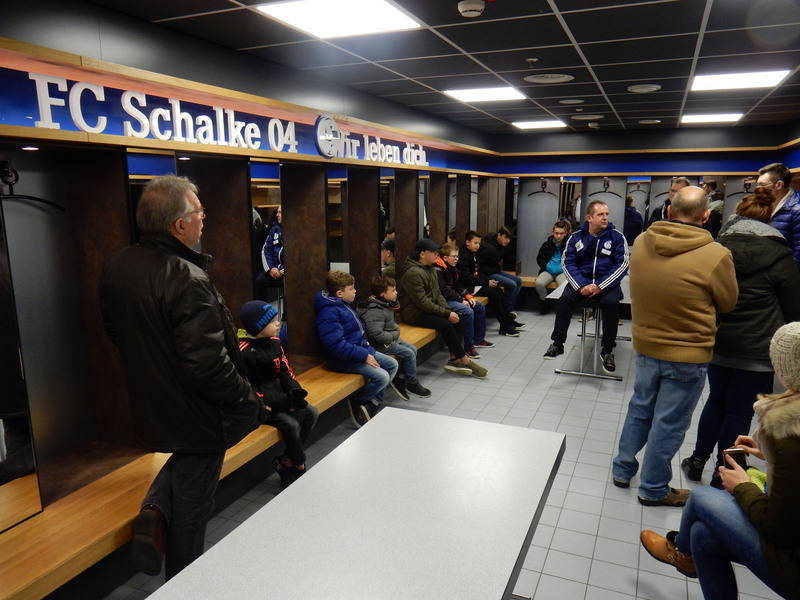 We visited Bayer Leverkusen - Freiburg and Roda JC - PSV and had stadiontours in the Schalke 04 Arena and in the Borussia Dortmund stadium. Beginning of September Real Vallodolid fan David Alonso did send me a package with magazines, stickers and scarves of Spanish clubs. Besides a scarf of his club David did send me a scarf of Ponferradina. Colleague Rikard Sehlin, living in Stockholm and Djurgarden fan spend three months in Berlin and added a scarf of Djurgarden to the collection, in exchange I gave him a FC Utrecht away scarf with the Djurgarden club colours which is now on the wall in his office in Stockholm. Sofar only two scarves of Australian clubs were in the collection. Steve Uiterwaal added a third one to the collection, a scarf of Brisbane Roar, the club of former FC Utrecht players Tommy Oar, Michael Zullo and Adam Sarota. Besides the Roar scarf Steve managed to get a country scarf of Lithuania, which means scarves of all three Baltic states are in the collection now. David Alonso from Valladolid is a fanatic fan of his local club Real Valladolid, playing in the Segunda Division in Spain. His club had a good start of the season with two victories and one draw. Because it is very difficult to get scarves of the clubs playing in the Segunda Division, David is helping me. In exchange he is now wearing the FC Utrecht home shirt of the 16/17 season. Collecting scarves unites. Over the last years I have been in contact with people from all over the world. Below some pictures. Son of Azreen Abdul Ghafor from Malaysia. 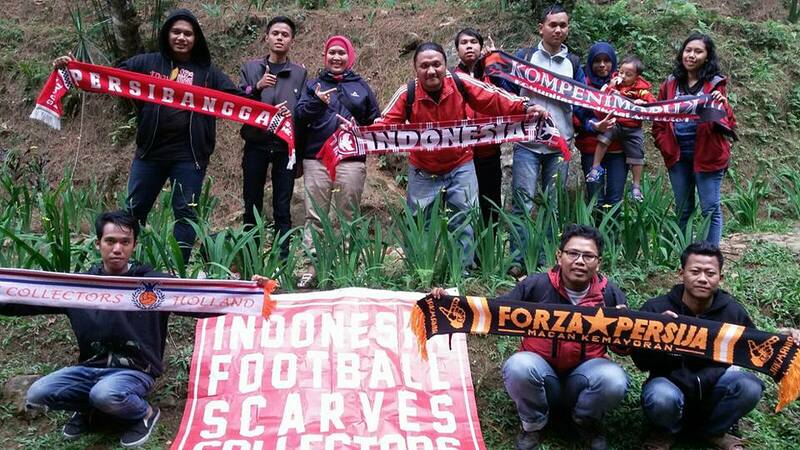 Aji Fajar with the Indonesia Football Scarve Collectors showing the Scarf Collectors Holland scarf. New season, new scarves but this month 6 vintage Feyenoord scarves have been added to the collection by Steve Uiterwaal, one of the them is from the days that fans were travelling by special fan trains, end seventies, beginning eighties. Often these trains were completely demolished by the fans. The scarf is an attempt to stop this. Scarf producer Roman from Moldavia added the second club scarf of Georgia (Dinamo Batumi) and Uzbekistan ( Nasaf Karshi) to the collection. During holiday in Belgium we visited Gent and could get a beautifull Buffalo scarf of AA Gent. Roda JC fan Bas Werry did send me a mail this month. Bas has his own business in merchandising and added some nice Roda scarves to the collection years ago. This month he got me a friendship scarf of Roda JC and Alemannia Aachen. 95 Liverpool scarves are now in the collection. A lot of scarves are 'vintage' scarves from the succesful periods in the seventies and eighties. This month Steve Uiterwaal managed again to get some of these 'vintage' scarves this month. One of them is a special bar scarf and another has been issued after season 1982/1983 - 14 times league champions. Unfortunately, Liverpool could not beat Sevilla in the European Cup Final. But everybody will remember the quarterfinal against Dortmund. From 1-3 behind to an endscore of 4-3 in twenty minutes. Besides this crazy turnaround of the game, the atmosphere at Anfield was great.The fans of Liverpool and Dortmund were singing and supporting their teams the full 90 minutes. Bernie Allen, Liverpool fan did send me the match scarf of this memorable match. With Waluyo, member of the Indonesian Scarf Collectors, I exchanged some scarves and he added two scarves of Japanes clubs to the collection. Steve Uiterwaal added the following Ultrascarf to the collection some time ago but it is a special one which I want to show in this monthly news letter. April 24 , 2016 F.C. Utrecht did play the Dutch Cup Final against Feyenoord Rotterdam. Disappointing match (1-2) but the atmosphere and the battle between the fans of the clubs which both had 50 percent of the tickets was impressive. This month , thanks to Roman from Moldavia the first scarf of a club from Kyrgyzstan is in the collection now : Dinamo mvd Bishkek. Andrey Bavin from the Ukrain added besides some scarves of clubs from the Faroer Islands a beautifull scarf of the Swedish club Sundsvall. April 24, 2016 my club FC Utrecht will play the dutch cup final against Feyenoord. The official scarf issued by FC Utrecht is shown below. 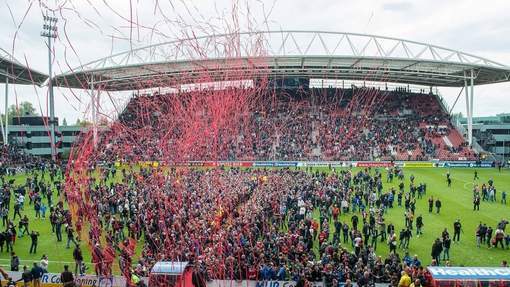 It will be the sixth time for FC Utrecht to play the in the final in the 46 years history of the club. At the football collectors fair I could add an IFK Goteborg scarf from the seventies. 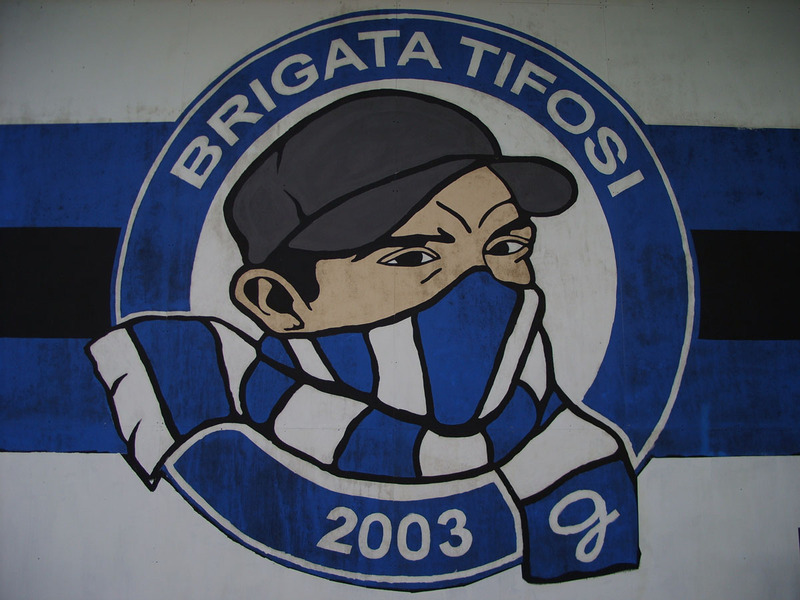 The montly contribution from Steve Uiterwaal is an Ultra Scarf of Rapid Bucaresti. Finally I had the time to put the scarves on the site of some Portugese clubs I took over from Marco Remijnse some months ago.One of them is shown below. Some special scarves have been added to the collection this month. FC Utrecht is playing the semi-final for the national cup against non-professional club VVSB from Noordwijkerhout. This club has issued a match scarf for this match. The atmosphere in the stadium which was sold out for this match was great thanks to the fans of both clubs. Colleague Michal Grabowski added a scarf of the polish club Piast Gliwice to the collection and my son Kevin visited Dusseldorf and brought a Fortuna Dusseldorf scarf with the city skyline on it with him. Another special scarf is the match scarf Celtic - Liverpool from 2003 which Steve Uiterwaal added to the collection. 2/8/75 - FC Utrecht - Liverpool 0 - 2. Thanks to Marco Remijnse , Steve Uiterwaal and collectors visiting the football collectors fair many scarves have been added to the collection. Not all of them have been uploaded to the site yet. That will happen the coming months. When you are collecting football scarves it is sometimes not possible not to add a scarf to the collection, even when you have already a scarf of that club in the collection. See for example the Bordeaux scarf added by Marco Remijnse. But it also gives a good feeling to show the first club scarf to the collection from a country which is not yet in the collection like the Neftchi PFK scarf added by Steve Uiterwaal, the club from Bakou, Azerbaijan with the nickname 'the oilworkers'. With Andrian Rico Palupa , I exchanged the Scarf Collectors Holland scarf for the Indonesian Football Scarf Collectors scarf. 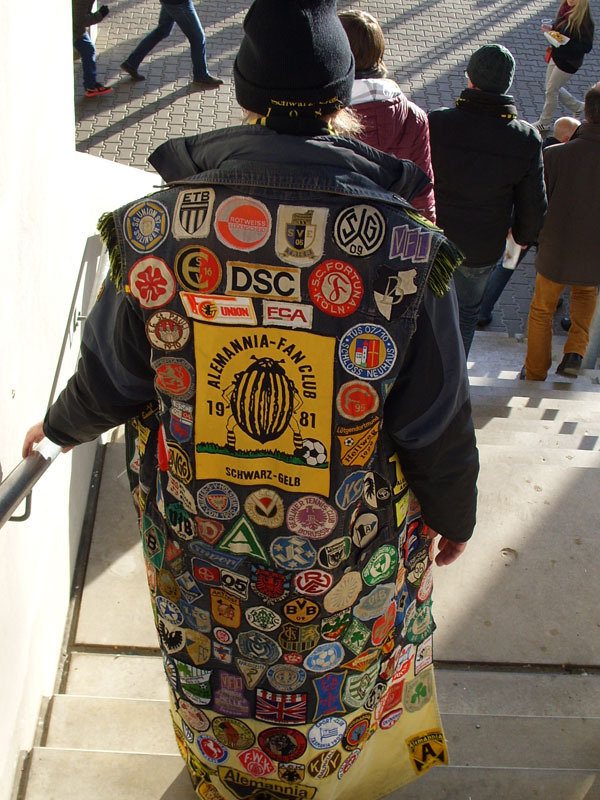 Beginning of October , I visited with the Scarf Collectors Holland Wattenscheid - Alemannia Aachen and Geel - Deinze. One of the members took the following picture of me and another member created a new picture showing our passion besides collecting scarves : ground hopping ! During the last three months a lot of scarves have been added to the collection. Colleague Fred Herberich visited Portugal for holiday and could get a Vitoria Setubal scarf. In August I visited the friendly Ipswich Town - FC Utrecht and it was good to see Bobby Robson was a FC Utrecht fan. Remco Neu, FC Utrecht fan and FC Utrecht collector added some FC Utrecht UEFA Cup match scarves to the collection. One of them is the away match Auxerre - FC Utrecht scarf. 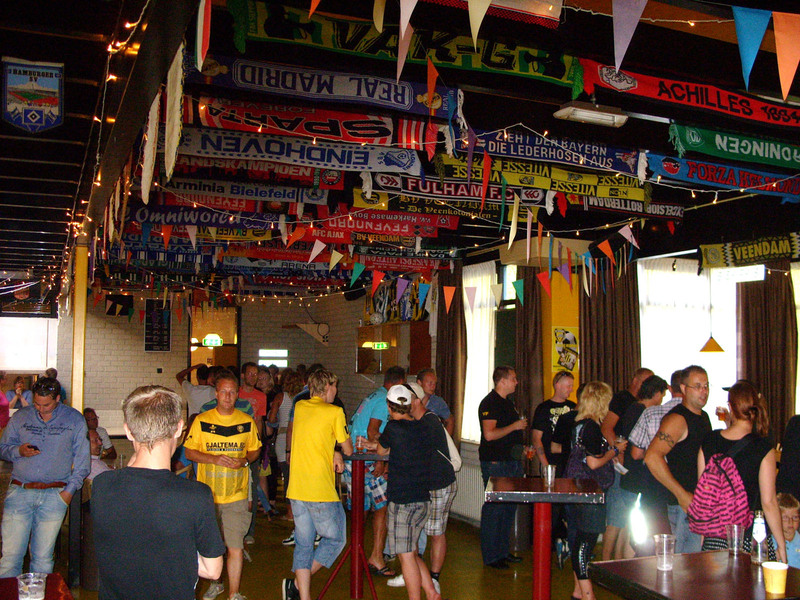 June 6 a football collectors fair was organized in the Telstar stadium, a second division club in the Netherlands. Very well organized ,a very good atmosphere and a lot of scarves for sale. I was able to add two match scarves of the 1995 European Cup Final Ajax - Milan (1-0) to the collection. Besides these scarves I could get the following clubscarves : Berchem Sport, Ashington, Bristol Rovers, Coventry,Celta and match scarves of AZ-Everton (2007) and Inter - Feyenoord (2002). Hubert Buter visited Warschau to watch the Europa League final Dnipro- Sevilla and could get the match scarf. Beginning of May my son Kevin and me visited Vfl Wolfsburg - Hannover 96 (2-2). 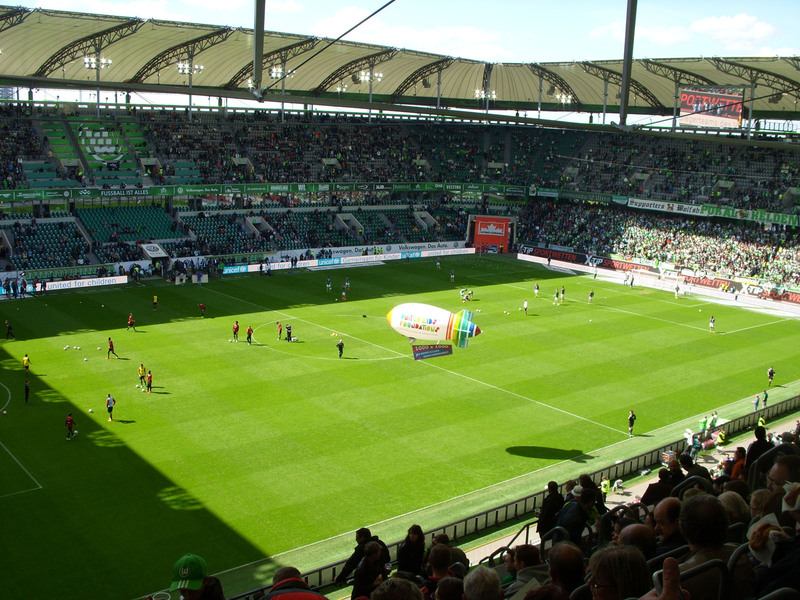 A lot of Hannover fans visited this important match to support their team that was fighting against relegation. 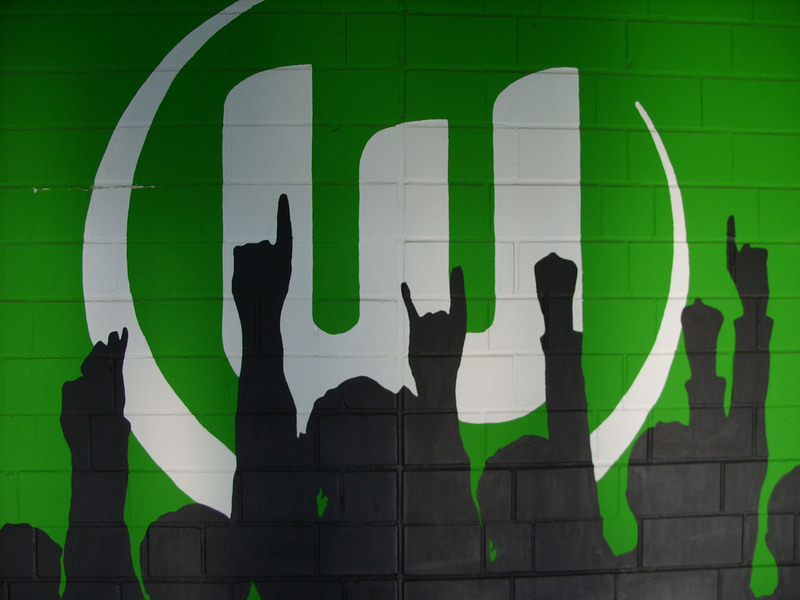 Wolfsburg were second in the table and in the race for champions league qualification. This resulted in an attractive match with great support from the fans of both clubs. This month I exchanged scarves with Radim Dolezal ( Czech) and Milan Buneta ( Croatia). In exchange for FC Utrecht scarves I could add club scarves of FC Slovacko and Mos and an Ultra scarf of Armada Rijeka to the collection. In May I had also contact with people offering scarves on the Internet , from Feyenoord fan Jeanne I could get a mega Feyenoord scarf and from Ricardo scarves of Ethiopia, Guoan (China) and Inter Milan (Brigate Neroazzure). Some rare scarves were added by Steve Uiterwaal this month, a club scarf of a club from Azerbaijan, Neftci PFK is now in the collection but also country scarves of Moldavia and Azerbaijan and club scarves of Tours, Antwerp ( X-side), Groningen (Z-side), Orient (England), Hvidovre IF (Denmark), Estrela da Amadora and Loures(both Portugal) , MSK Zilina (Slovakia), Maccabi Haifa (Israel) and Metalist Charkov (Ukrain). Scarf collector anf FC Utrecht fan Jasper Oostlander visited Barcelona this month and managed to get a ticket for Barcalona - Bayern Munchen. Besides watching the match he bought also a match scarf. April 6 , I visited Eindhoven - Telstar, a match in the Jupiler League, the second division in the Netherlands. Nice stadium , good atmosphere and another victory of the home team (1-0). March 7, I visited the football collectors in Gouda with Steve Uiterwaal. Wim Boels from Belgium and Hubert Buter were also present and I was able to add scarves of Tienen (Belgium) , Caen (France), Jablonec (Czech) and Aalesunds (Norway) to the collection. Steve Uiterwaal added this month a scarf of Robbie de Wit to to the collection, he played 42 matches for FC Utrecht in the seasons 1982/83 and 1983/84. 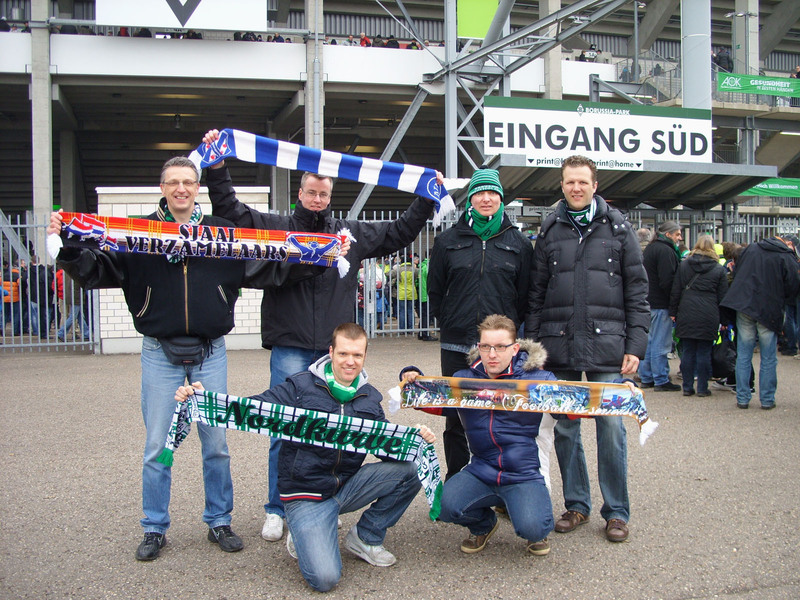 End of March 3 members of Scarf Collectors Holland visited 4 matches in Germany and Czech. 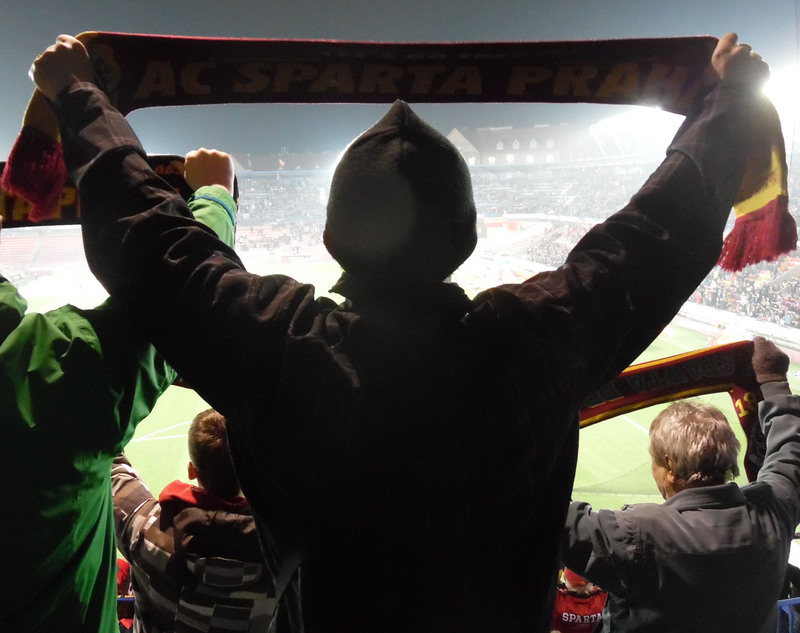 Just before the match Sparta Prague - Teplice, Jelmer Boots was able to shoot this 'scarf picture'. 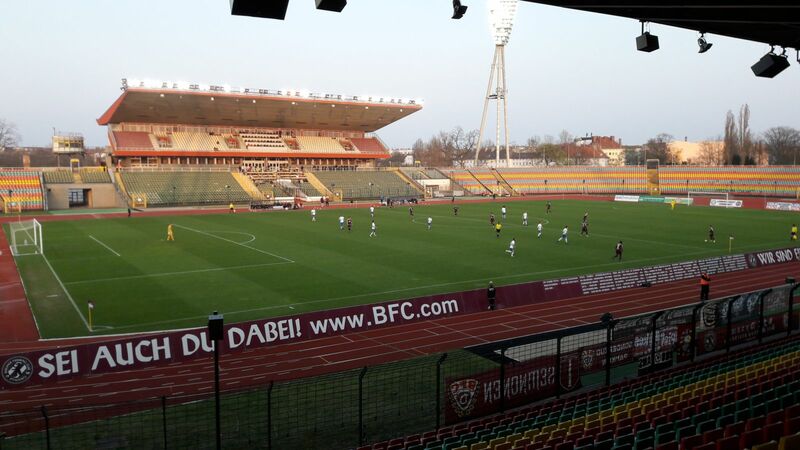 In Dresden they visited Dynamo Dresden - Hallescher FC with an impressive start of the game. Thanks to Jelmer Boots and Steve Uiterwaal a lot of FC Utrecht scarves from the eighties and nineties could be added to the collection. Two of them are really special , I did not know that they were issued in these years. In the beginning of the month one of the members of Scarf Collectors Holland, Marco Remijnse visited me. He is focusing more and more on scarves of Dutch and German clubs and he gave me the opportunity to add scarves of several clubs from different countries like Angola, Argentina, Chile (Colo-Colo), Paraguay, Colombia, Bolivia, Mexico,Brazil, Uruguay, Egypt, Mocambique and Japan to the collection. In January I also received a mail from FC Twente fan and scarf collector Aaron van Maanen, thanks to him I could add scarves of Darmstadt, Erberzige Aue and Holstein Kiel to the collection. In exchange for vintage Arsenal and vintage Liverpool scarves Aji Fajar from Indonesia did send me a country scarf of Indonesia and two club scarves.The first scarves from Indonesia in the collection. FC Utrecht fan Steve Uiterwaal is checking the Internet almost every day and thanks to him I am able to add old scarves of FC Utrecht which are difficult to get to the collection. In January his contribution was the 'Hans van Breukelen' scarf , issued when van Breukelen was transfered to Nottingham Forest and a scarf issued when FC Utrecht won his first trophy , the Dutch Cup in 1985. Speaking about old scarves, Melvin Cruijs added three vintage Liverpool to the collection issued in the eighties. Because of the number of new scarves not all the pictures of the scarves are on the site yet but they will be there first week of February. During the month October, I have moved my scarf collection from the attic-floor where the scarves were stored in boxes and suitcases to a room on the first floor. For the first time in my life that the scarves can be seen all together. In exchange for pins of dutch clubs, Alex Zamora, living in Dallas, did send a scarf of San Antonio Scorpions and a match scarf of the match USA - Panama. Thanks to Marco Huijnen I could add more than 40(!) Celtic scarves to the collection. Old colleague Rob Porton brought me a souvenir from Spain : a Valencia scarf. At the football collectors fair in Houten, Wim Boels and Kris van Elst were present and thanks to them I could add scarves of Diest, Dundee United, Everton, Thor Waterschei, Boom, FC Antwerp, Winterslag and St.Truiden to the collection. Colleague Gary Andrews added a scarf of Manchester United to the collection which his father was wearing when he visited United games. Pictures of these scarves will be shown on the site next month. A new season has started, new scarves are for sale in the fanshop of your favourite team. F.C. Utrecht did issue a home scarf and an away scarf in the same colours of the away shirt. 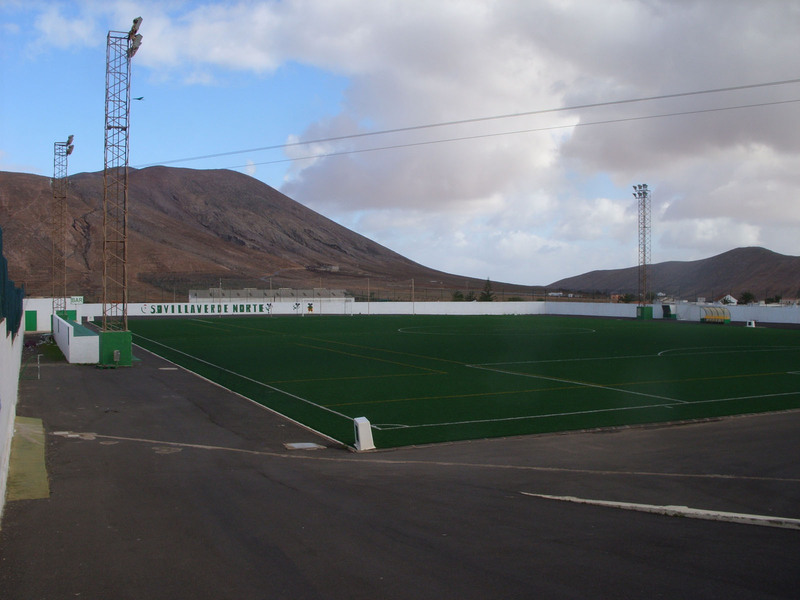 In July I visited my sister Ingrid and brother in law Ruud who are living on Fuerteventura, one of the Canary islands.There I met their neighbour from England, Stuart and talked with him about football. Back home he suprised me with a scarf of his club , Scunthorpe United. The monthly contribution from Steve Uiterwaal are a vintage Celtic scarf and the match scarf of 1999 Champions League Final Manchester United - Bayern Munchen. The 1999 UEFA Champions League Final was a match that took place on Wednesday, 26 May 1999. The match was played at Camp Nou in Barcelona, to determine the winner of the 1998-1999 UEFA Champions League. 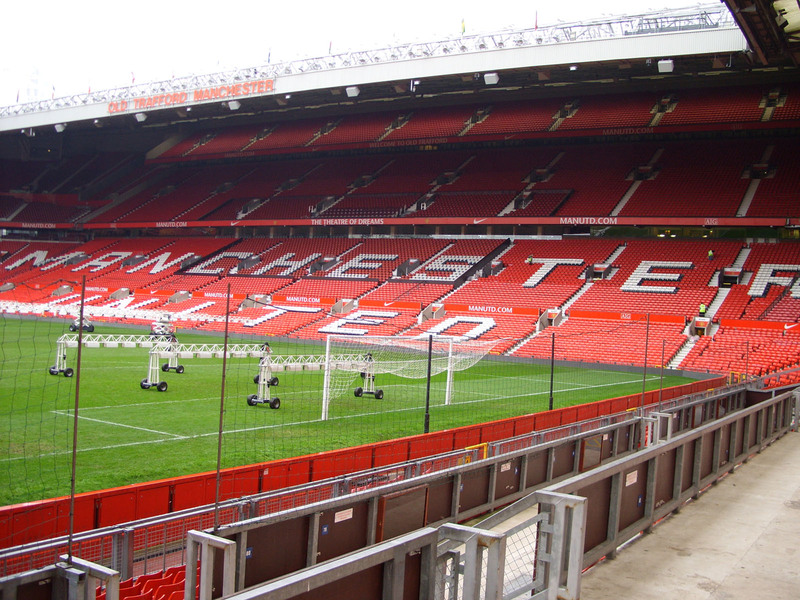 The match is best remembered for Manchester United scoring two last-minute goals in injury time (1–1 Sheringham, 2-1 Solskjaer). United's victory was the culmination of their Treble-winning season after they had already won the Premier League and the FA Cup earlier in the month. During the world championship football I visited Berlin for work and saw Germany - Algeria at the 'Fanmeile', the place in the center of Berlin where German fans are watching the games of the national team on big screens. Besides food and drinks also scarves were for sale. I bought scarves of Dynamo Berlin, Union Berlin, Borussia Dortmund ,St. Pauli and Germany. My son Kevin visited Nantes for work and added an 'Allez Nantes' scarf to the collection. Old colleague Peter van 't End is visiting all places of the world with his son Noël, top judoka in the Netherlands. In Bakoe he bought a scarf of Azerbaijan for the collection. June 4 , me and my family did visit the last friendly of the dutch team against Wales. As usual a good atmosphere in the stadium. For all these fans not travelling to Brazil it is fun to see the players of the national team not only on television but also live in the stadium. The Worldchampionship in Brazil has started and via Internet I could get the country scarves of Iran and Ghana. With Hapoel fan Stephanos Theodossiou I exchanged a Joost Broerse scarf for a Cyprus scarf. PEC Zwolle fan Tommy Schuurman designed a F.C.Utrecht - PEC Zwolle friendship scarf for his friend and F.C. Utrecht fan Martin van Opstal. Melvin Cruys added three 'end of the seventies' - Liverpool scarves to the collection and thanks to a tip from Steve Uiterwaal I could get a Celtic- Borussia Dortmund friendship scarf. Scarves of clubs from competitions which were not yet in the collection have been added to the collection in the month May. Thanks to Edgars Zaķis, a scarf of Metta (Latvia) is in the collection. Andrey Bavin,living in the Ukrain added clubscarves of B68 and Klaksvik, both from the Faroe Islands and a country scarf of the Faroe Islands to the collection. Via a tip from Steve Uiterwaal I could get a Guangzhou scarf (China) from NEC fan Hans Seegers. Steve could also get me a special 'burberry' BvB Dortmund scarf. Colleague Jonas van Mansfeld did spend his holiday on Canary Island Lanzarote and found a Union Deportiva Lanzarote scarf. Collector Hubert Buter made a trip to Switserland and Italy, did visit the European Cup final Benfica - Sevilla and some matches and was able to get scarves of Novara, Spezia, Trapani and the match scarf of the European Cup final. The number of Liverpool scarves issued is endless and also the number of Liverpool scarves in my collection is growing fast, fan Mike Streur added this month 10 Liverpool scarves to the collection. 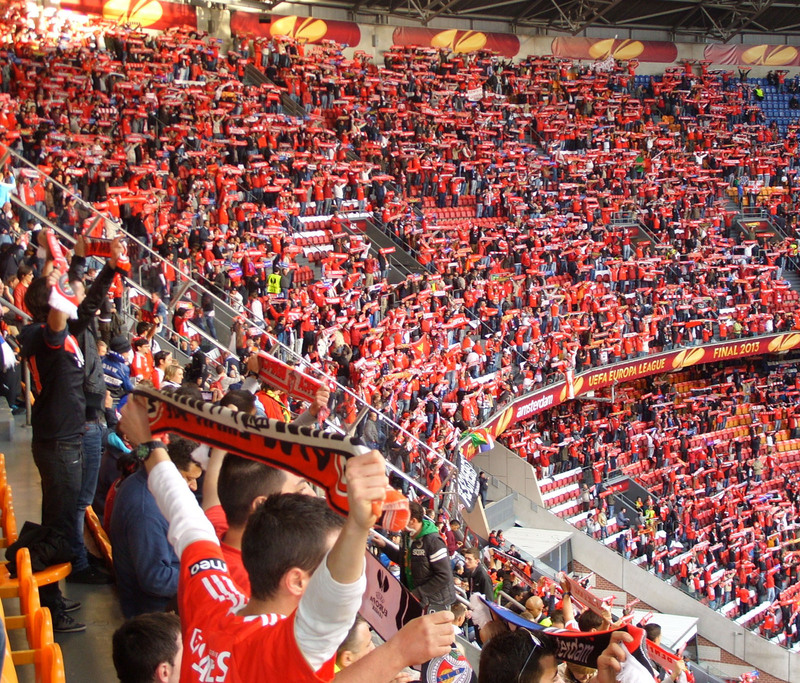 Among them is the 2001 UEFA Cup Final - Liverpool - Alaves (5-4) match scarf. From April 11 until April 15, my son Kevin and I visited Italy for an international 24 hours Slotracing race. 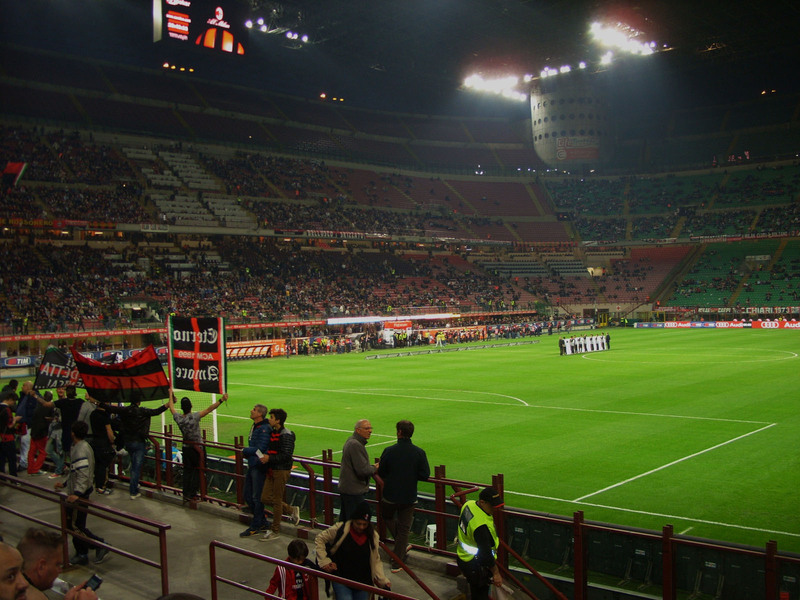 After a succesfull race I took the train to Milan to visit the match AC Milan - Catania (1-0). I arrived just before the match, needed a passport for buying a ticket but found the time to buy a Milan bar scarf and an Ancona scarf. With 41.000 people the impressive stadium was half full. Milan won the match but is struggling this season and Catania, bottom table at that moment deserved at least a point. Special to be here because so many historical matches(among them European Cup Final Feyenoord - Celtic (2-1) in 1970) took place here and so many famous players did show their talents like van Basten and Bergkamp. 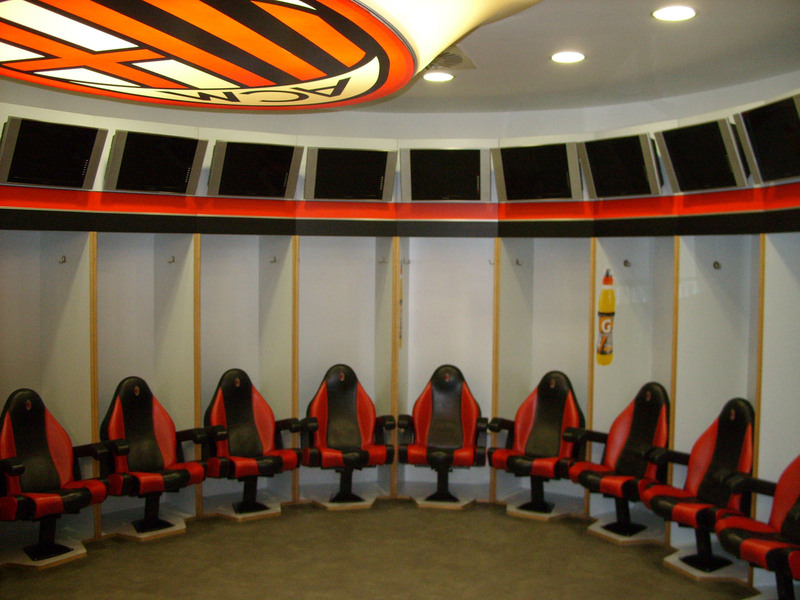 Next morning I did the stadium tour and visited the Stadium and the San Siro Museum. 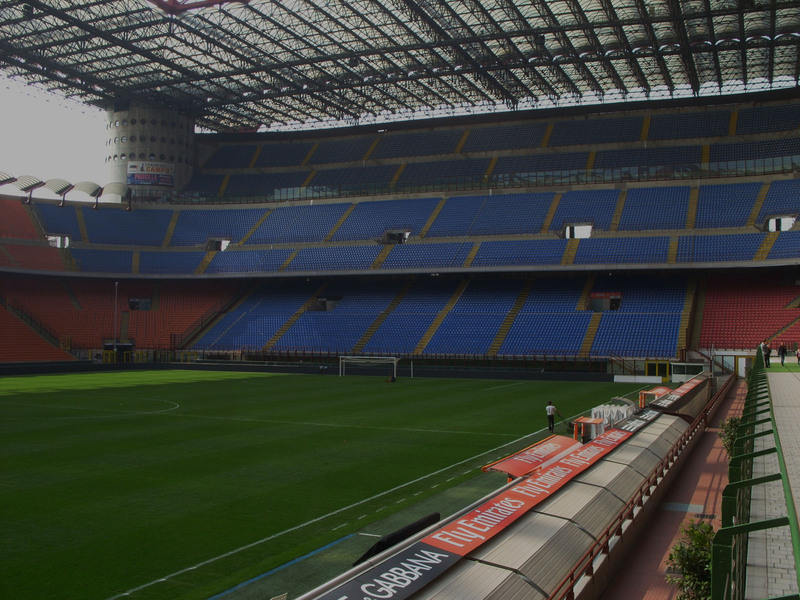 Stadium, Museum and Fanshop are all shared by Inter and Milan. Every two weeks all sponsor names are changed. Before leaving to the airport , I bought scarves of Pescara and Sassuolo in the centre of Milan which means all Serie A teams are now in the collection. April 21 , Scarf Collectors Holland had their seventh trip, click on the SCH scarf on the Homepage for a small trip report. We exchanged scarves before we travelled to Essen in Germany and Mechelen in Belgium where we visited stadiums and matches and bought scarves.The following scarves are now in the collection : Benfica de Luanda (Angola) , SV Meppen, Rot-Weiss Essen, Schwarz-Weiss Essen, Flora Talinn, KV Mechelen and Avellino. Last but not least , the monthly contribution from Steve Uiterwaal to the collection : he found two Celtic scarves on Internet which were not yet in the collection. One of them is a printed scarf from the eighties. Thanks to Deinze fan and scarf collector (see links) Petro Depraetere, scarves of all the clubs of the Belgium Pro League are now in the collection. Petro has been able to get scarves of the following clubs : OH Leuven, Kortrijk, Waasland Beveren and Zulte Waregem. Thanks Petro ! Some silk FC Utrecht scarves from the period 1975 - 1985 were added to the collection by FC Utrecht fan Melvin Cruys. Among them the Cupwinner 1985 scarf. United and F.C. Utrecht fan Steve Uiterwaal is checking the internet every day and he knows my favourite clubs. This month he could get two silk scarves of F.C. Utrecht ,a Liverpool one and a very old Celtic scarf from the sixties (!). In February two scarves of clubs far away from Holland were added to the collection. Old colleague Peter van 't End visited Abu Dhabi and got a scarf of Al Wahda and colleague Berry van der Haring did spend his holiday in Australia and bought me a scarf of Melbourne Heart, the club where his friend Robbie Wielaert is playing. 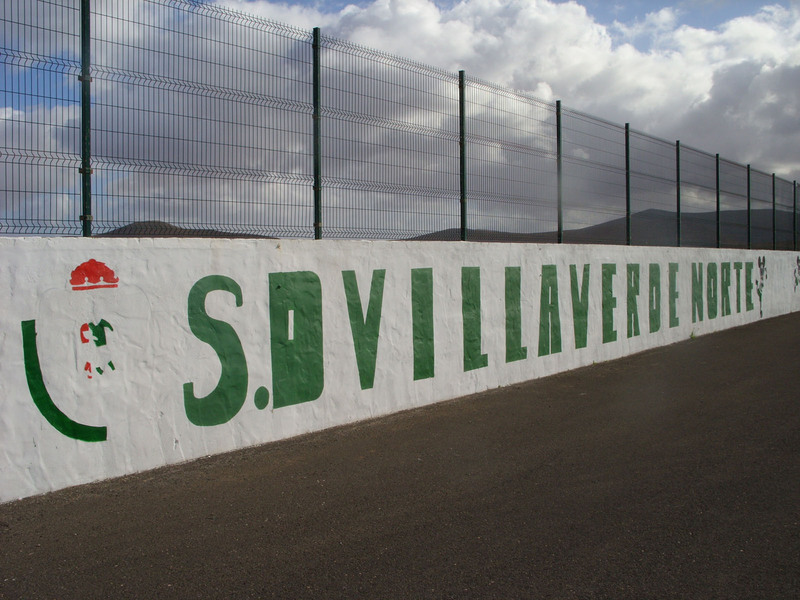 Later this month I visited my sister in Fuerteventura and could get a special Real Madrid scarf : Sangre Blanca, White blood. A fanatic Zuid Trubine fan asked me to design a F.C. Utrecht - Sterrenwijk friendship scarf. Sterrenwijk is part of Utrecht close to the stadium. At the footballcollectors fair I added scarves of Celttic, Liverpool, Patro Eisden, Boca Juniors and friendship scarves Vitesse - Lierse and Antwep - Liverpool to the collection. FC Utrecht ,the club I am supporting now for 40 years won 3 national cups in their history and the first victory was in June1985 against Helmond Sport. Steve Uiterwaal has been able to get the more than 28 year old scarf which was issued after the match and which is now in the collection. By adding the Achilles 29 scarf, the scarves of all Jupiler clubs are in the collection again. My brother in law , Jan Smit visited Valencia - Real Madrid in December and bought a 'Amunt Valencia' scarf for me. Also this month I exchanged scarves of our favourite clubs with a colleague footballfan. Andras Domjan, Ultrafan of Ferencvaros did send me a Ultrascarf of his club, in exchange I did send him a FC Utrecht - Bunnik side scarf. Via Internet, I got in contact with Jeffrey, thanks to him some beautifull scarves of Liverpool, Celtic, Dortmund , Leeds and Panatinaikos are now in the collection. 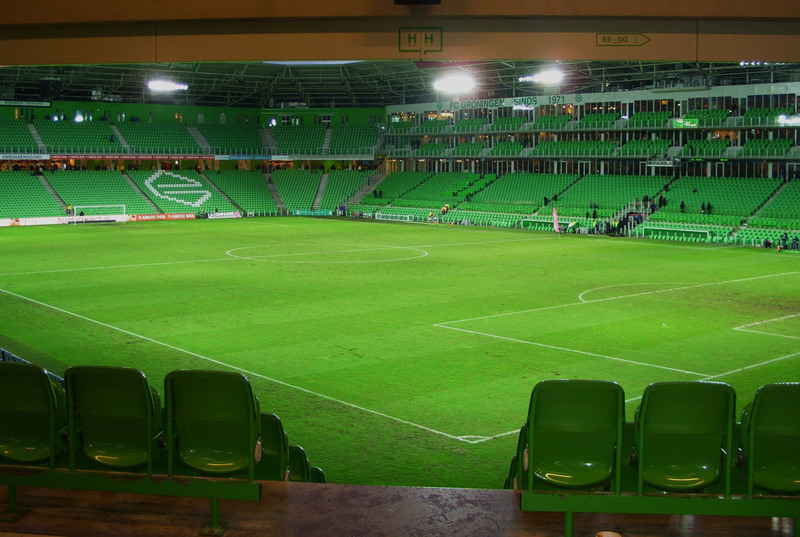 In December I visited besides the FC Utrecht home games two other matches in the Netherlands, Vitesse - Cambuur in the Gelredome in Arnhem and FC Groningen - NEC in the Euroborg (the green cathedral) in Groningen. At both stadiums I bought a scarf of the hometeam and in Groningen I also bought a special province Groningen scarf. and scarves of Real Madrid, Tottenham Hotspurs, Nottingham Forest , Feyenoord, Liverpool and Manchester United which were not yet in the collection. Another FC Utrecht fan, Melvin Cruys had some Liverpool scarves from the 70's and 80's which I could not refuse. Colleague and PSV fan Berrie van der Haring added another PSV scarf to the collection, 100 year PSV ; 1913 - 2013. Early November I exchanged again some scarves with Viallis Giakis, I did send him some scarves of dutch clubs and in exchange he did send me scarves of Armenia, Larissa, Olympiakos Volos and Panetolikos. Scarf Collectors Holland member Marco Remijnse did buy a box full of old scarves and some of them were Liverpool and Celtic scarves which are now in the collection. In the F.C. Utrecht fanshop I could buy two player scarves : the second David di Tomasso scarf and a Leon de Kogel scarf. This month I visited with my son Kevin the city of Brussels for a 24 hours slotrace and I took the opportunity to visit the stadium of Royal White Star Brussels and to buy a scarf of this club. In November I received an e-mail from Stéphane Germanier , fan of FC Sion and we decided to exchange scarves of our favourite clubs. FC Utrecht fan Steve Uiterwaal added a DHSC scarf with the old DOS canary in the club logo and an old silk Borussia Dortmund scarf to the collection. Old collegue Peter van 't End visited Rio de Janeiro for the worldchampionship Judo where his son Nöel did participate and bought a Brasil 2014 scarf. Collegue Vi Hung Luong visited Lissabon this month , saw the Brasil 2014 play-off match Portugal - Sweden and bought the match scarf. Greece, Belgium, Switserland, Holland, Brasil, Portugal...scarves are finding their way to the collection from all over the world. Beginning of October I visited the football collectors fair in Houten. A lot of sellers this time and among them Kris and Wim from Belgium. They brought a lot of scarves with them and I could add a lot of scarves to my collection, not only new scarves but also scarves from the periode 1980 - 1990 ; Liverpool, St.Truiden, Boom, Lokeren, Hasselt, Witgoor, and friendship scarves Brugge - Liverpool and Liverpool - Genk. From other collectors I could get old scarves of Nottingham Forrest , Manchester United and the 1987 Ajax EC II final scarf in Athens against Lokomotive Leipzig. Scarves of the EC Finals of PSV (1988) , Feyenoord (2002) and Ajax (1987,1992,1995,1996) are now in the collection. 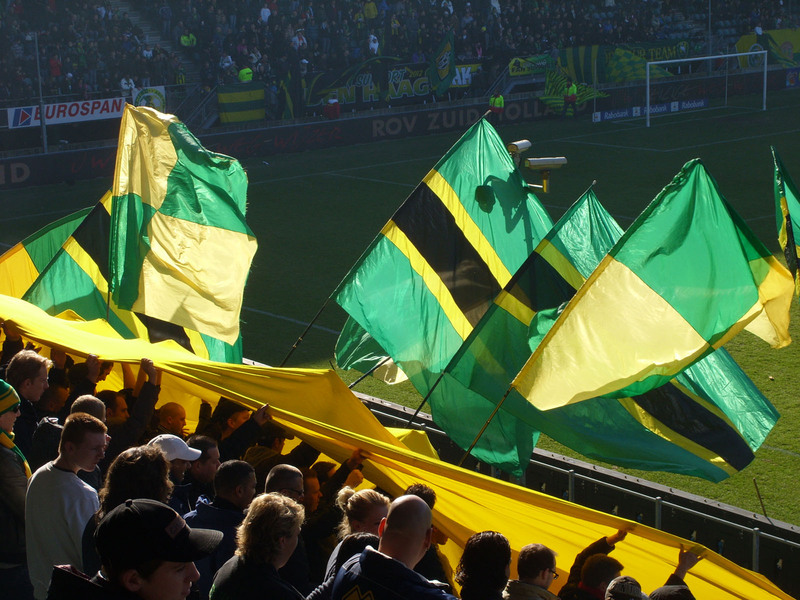 ( See http://www.footballscarves.nl/clubs_countrie.php?land_id=1028 and http://www.footballscarves.nl/matches.php). In October I received a mail from Eelis Goebel, who is fan of IFK - Helsinki and FC Utrecht because he lived for some years in Utrecht. Thanks to him the first club scarf from Finland is in the collection. Picture of the scarf will be there in November. In exchange I did send him a Bunnikside scarf. During October my brother-in-law Wim van de Gein has made some changes of the site, logo's of Liverpool, Celtic and Borussia Dortmund have been replaced by pictures of scarfs of the clubs, there is a new Poll, an article about the collection in the Fan magazine of FC Utrecht fan club True Support can be found under News and a new item, Scarf of the Month has been introduced on the Home page. Beginning of this month, I received a mail from Edgars Zakis from Latvia, who suggested to exchange a F.C. Utrecht scarf for a country scarf of Latvia, so that I could add a scarf from Latvia to the collection. Collecting football scarves unites ! Via internetsite Marktplaats I could buy another Celtic - F.C. Utrecht matchscarf from F.C. Utrecht fan Hilbert. He added also an AC Milan Ultra scarf to the collection : 'Fossa dei Leoni'. Wikipedia : The Fossa dei Leoni, also referred to by the acronym FdL, was an association of ultra supporters of Italian professional football club AC Milan established in 1968, it was the first ultras group in Italy.The association, after 38 years of activity, was officially dissolved at 17 November 2005 by its members when two banners were robbed after the match AC Milan - Juventus of 29 October 2005. Manchester United and F.C. Utrecht fan Steve Uiterwaal added 6 silk F.C. Utrecht scarves to the collection which were issued in the period 1975 - 1980. There were only a few F.C. Utrecht scarves from this period in the collection untill now and these scarves are very difficult to get. Today there are 125 F.C. Utrecht scarves in the collection showing the history of the club and the development of the football scarf. Steve also added a friendship scarf of my favourite clubs Celtic and FC Utrecht to the collection. In the collection there are now 8 official and unofficial scarves related to the two Europe League play-off matches in 2010. Beginning of July I visited Jelmer Boots together with other footballscarf collectors. 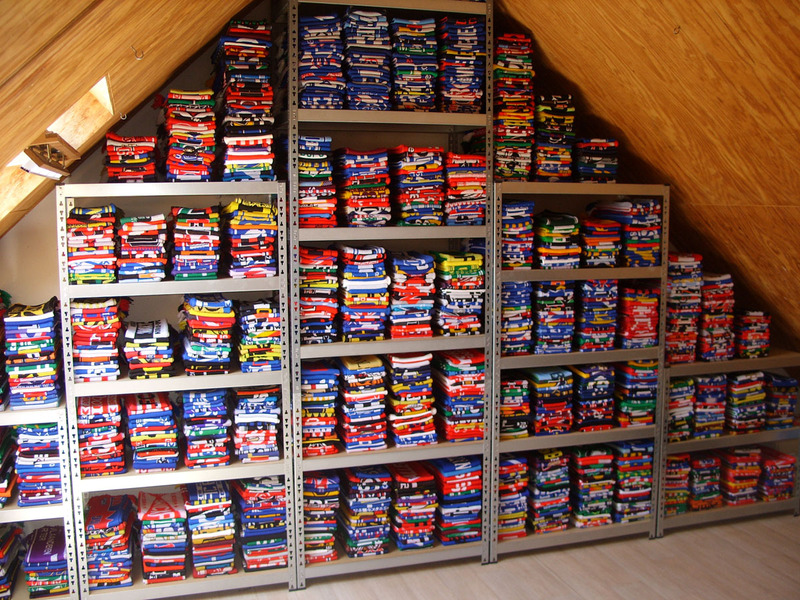 Jelmer has the biggest football scarf collection in the Netherlands. We also exchanged some scarves and scarves of Jubilo Iwata(Japan), Olimpia Beltsy(Moldavia), Chindia Targoviste (Romania), Concordia Chiajna(Romania) and Jiul Petrosani(Romania) have been added to the collection. The same day we visited Telstar - Hartlepool and the stadium of HFC Haarlem, the club that went bankrupt in January 2010. In July I also exchanged a Hammarby scarf that I bought in Stockholm last month for a scarf of FC Dallas with Bria Connors from Dallas. The Dallas scarf is the fourth USA club scarf in the collection. During my holiday I bought a country scarf of Bulgaria and a club scarf of CSKA Sofia in Bulgaria and in Istanbul I was able to add scarves of the following clubs to the collection : Adanademirspor, Bayburtspor, Boluspor, Kasimpasaspor, Mardinspor, Sinopspor and Trabzonspor. My neighbour Stijn spend his holiday with his family on Corsica and bought for me a Forza Bastia scarf. With some delay I received the package from Alberto Javier from Venezuela with a scarf of Yaracuyanos. Alberti Javier is collecting pennants and is exchanging scarves for pennants with a lot of scarf collectors in Europe. Back from holiday I visited some matches in the dutch eredivisie and the Jupiler League, the second division in the Netherlands. 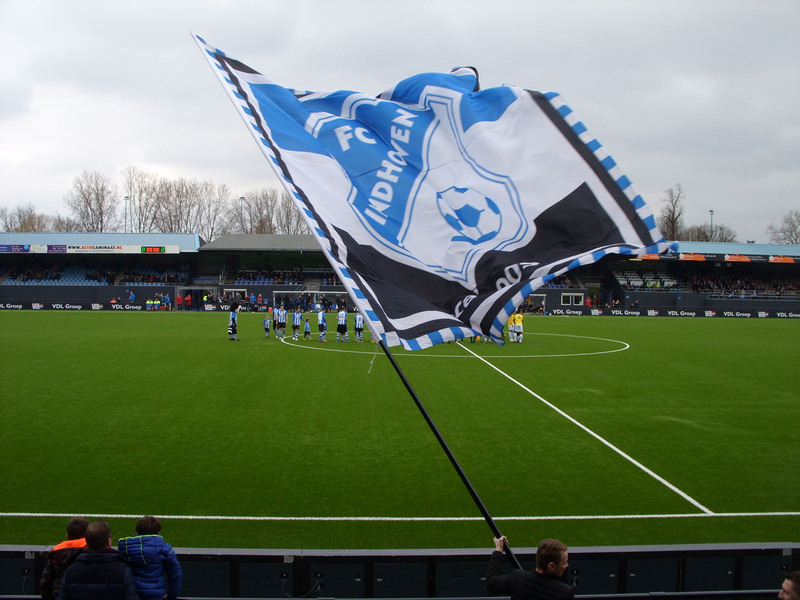 I visited Graafschap - Almere, Sparta - VVV, FC Utrecht - AZ and FC Den Bosch - Graafschap. New scarves of the home-teams have been added to the collection. June 10, I was in Stockholm and visited Hammarby IF against Varberg (2-2). 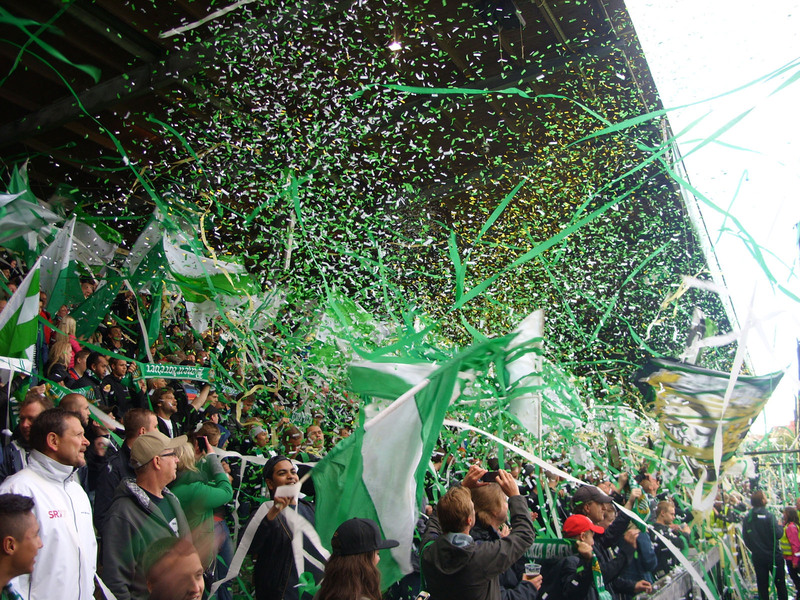 Hammarby is playing in the second division in Sweden but has an average crowd of around 9.000 and the club has a fanatic fan base. Unfortunately the club will move to the Tele 2 Arena this summer and leave Söderstadion. The atmosphere in the stadium was great , the ultra's were supporting the home team the full 90 minutes and also the other stands with fans reacted with songs.Before the game I bought three Hammarby scarves, two for my own collection and one for Bria Connors from Dallas who will send me a FC Dallas scarf in return. In June I exchanged scarves again with Aris Thessaloniki fan Vlassis Giakis, I did send him some scarves of West European clubs and he did send me scarves of Veria, Panthrakikos, Asteras Tripoli and Apoel Nicosia (Cyprus) and El Basani (Albania). The last weekend of June, I visited Jeroen de Waard in Wilnis, via internet he offered beautifull scarves of Celtic and Ireland but I left his house with a full bag also containing scarves of Hungary, the Milan derby,Dortmund, Besiktas, Fenerbahce, Kaiserslautern, Austria Wien, Sporting Lissabon and a special XXXL Ultra scarf. 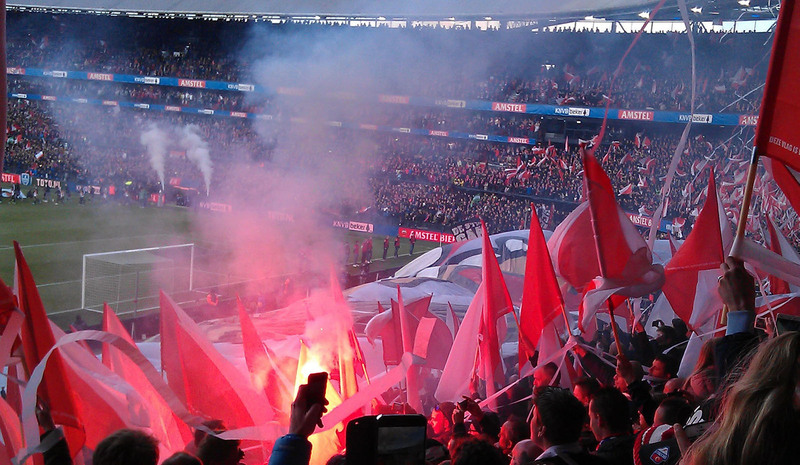 May 5, I saw the match Heerenveen - FC Utrecht. Thanks to Jelmer Boots, owner of the biggest football scarf collection in the Netherlands and Heerenveen fan, I could get a ticket. 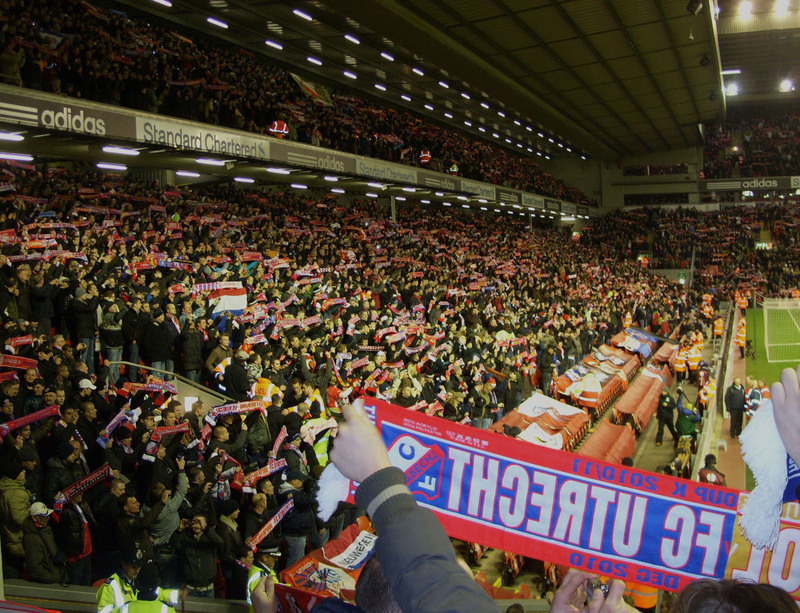 It was for me the first time I visited a match in the Abe Lenstra stadium. Jelmer showed me the stadium and the fanzone under the 'Oost' - stand which is very impressive. 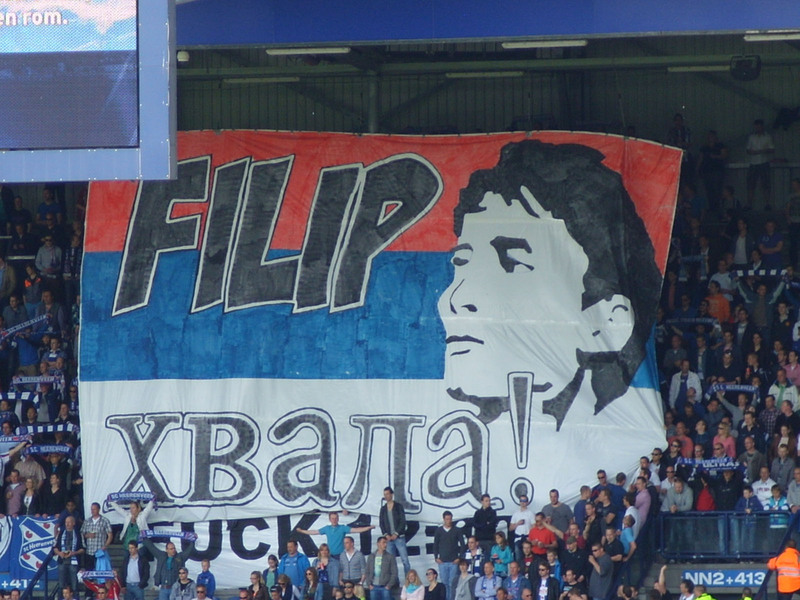 Heerenveen has two fan clubs, Nieuw Noord and FeanFan, Nieuw Noord was showing a big banner of Filip Djuricic as it was his last match for the club and FeanFan was showing the club colours with flags and confetti just before the match. On the way back two F.C. Utrecht fans offered me to drive with them to Utrecht. With one of them, Melvin Cruys, I exchanged some Liverpool scarves a week later just before the match F.C. 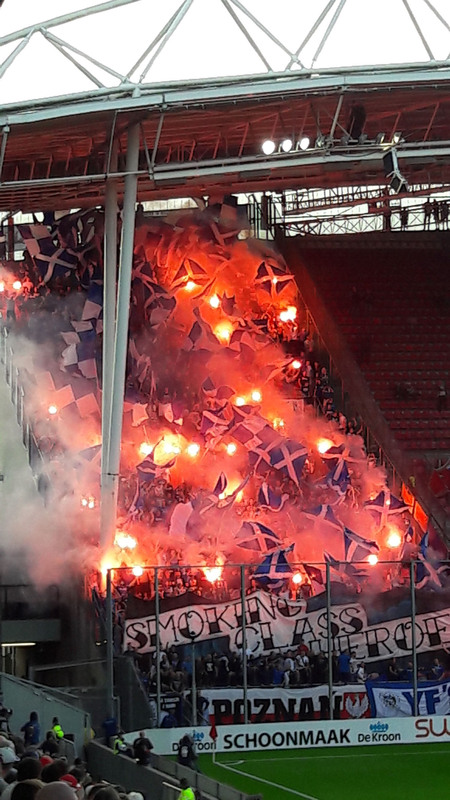 Utrecht - Heracles. Also in May I received the scarves send by Alberto Del Cura Delgado from Venezuela (Estudiantes de Merida and Mineros) in exchange for some pennants. May 15, I saw the Europe League Final Benfica - Chelsea (1-2) in the Amsterdam Arena together with Damian O'Sullivan, a footballfan living in Rotterdam. We both enjoyed the exciting game and the whole evening was a very special experience with two fanatic fan groups. I bought two match scarves, one official and one non-official. Colleague Jeroen Clijsters heard about my collection and added the scarves of the following clubs to the collection : ADO Den Haag, AZ, Roda JC, AC Milan, Real Madrid and match scarves of PSV - Spurs and Ajax - Steaua. The climax of the season for me was that F.C.Utrecht is back in Europe again since 2010 after beating Heerenveen and F.C. 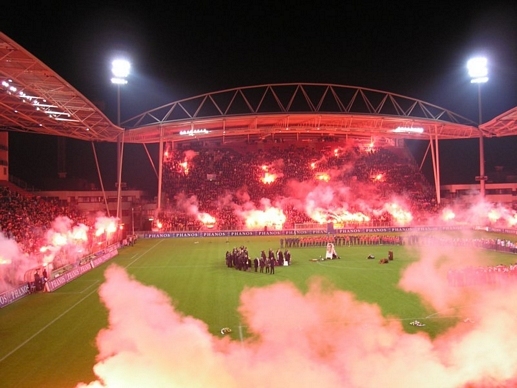 Twente in the play-offs. F.C. Utrecht fan Martin Opstal asked me to design a special scarf for footballer Joost Broerse, cupwinner for F.C. Utrecht in 2003 and 2004. The week before the match PEC Zwolle - F.C. Utrecht Joost brought some match tickets to Martin who gave him the scarf. all 15 scarves are sold out now, another 15 are ordered. With Vlassis Giakis , super fan of Aris Saloniki , I exchanged dutch club scarves for scarves of clubs from Greece. Scarves of Ilioupoli, Appolon Athens, Ethnikos Piraeus are added to the collection. Scarf Collector Holland Jelmer Boots added the following scarves to the collction : Ascoli, Nancy, Toulouse, Huelva, Alaves and Compostela. April 5 and 6, the Scarf Collectors Holland had trip number 5, for a trip report and pictures see http://www.footballscarves.nl/sch.php or click on one of the S.C.H. scarves on the home page. 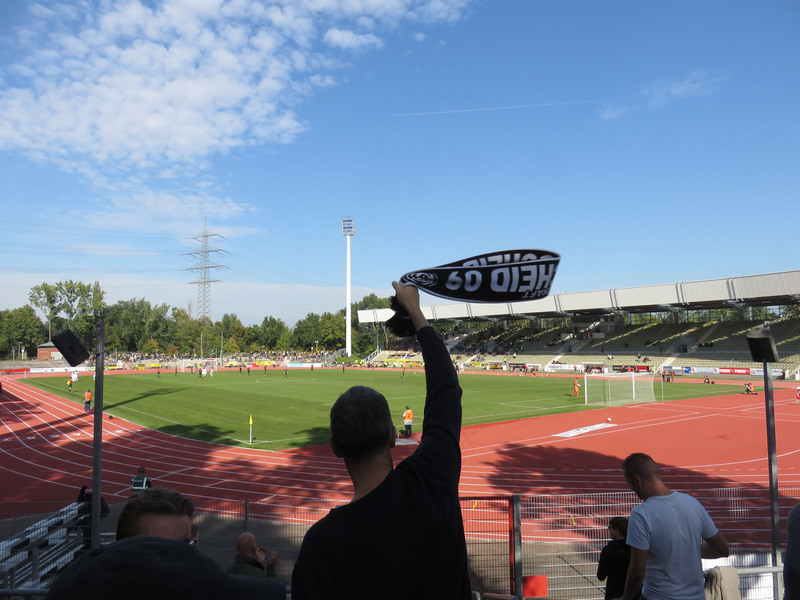 This time we saw Kaiserslautern - Köln, Borussia Mönchengladbach and Patro Eisden - Virton. Before the trip we visited scarf producer TIFO where I could buy scarves of ADO, AZ, GVVV, Wolverhampton, F.C. Utrecht and Willem II and before the matches I bought a bar scarf of Kaiserslautern, a Nordkurve scarf of Borussia Mönchengladbach, a Fürth scarf and a Patro Eisden scarf. March 2, there was another football collectors fair in Houten, near Utrecht. Thanks to super football collectors Wim Boels and Kris van Elst from Belgium I could add a lot of scarves to my collection. They brought also some scarves with them for Vlassis Giakis, Aris Thessaloniki fan who will send me scarves of clubs from Greece and Albania. Scarves added to the collection : Beringen, FC Luik, RWDM, Brighton, Bristol Rovers, Luton Town, QPR, Stoke City, Yeovil Town, Cardiff City and special scarves of Liverpool, Birmingham and Celtic. Later this month F.C. Utrecht scarf collector Jasper Oostlander bought a beautifull Malaga CDF scarf for me when he visited this Malaga during holiday and Ben Visscher did send me a PEC Zwolle Cup-fighter scarf which will be shown on the site in April. In January I was able to extend my collection with some scarves of Brazilian clubs which were in the collection of Marco Remijnse, member of Scarf Collectors Holland. Goianense, Paranaense, Chapecoense, Corinthians, Criciuma, Figureinse, Portuguesa, Santa Cruz, Vasco da Gama are now in the collection. Thanks to Marco also scarves of Wydad and Raja from Maroc and Aydinspor, Batmanspor, Nigdespor and Turgutluspor from Turkey are in the collection now. 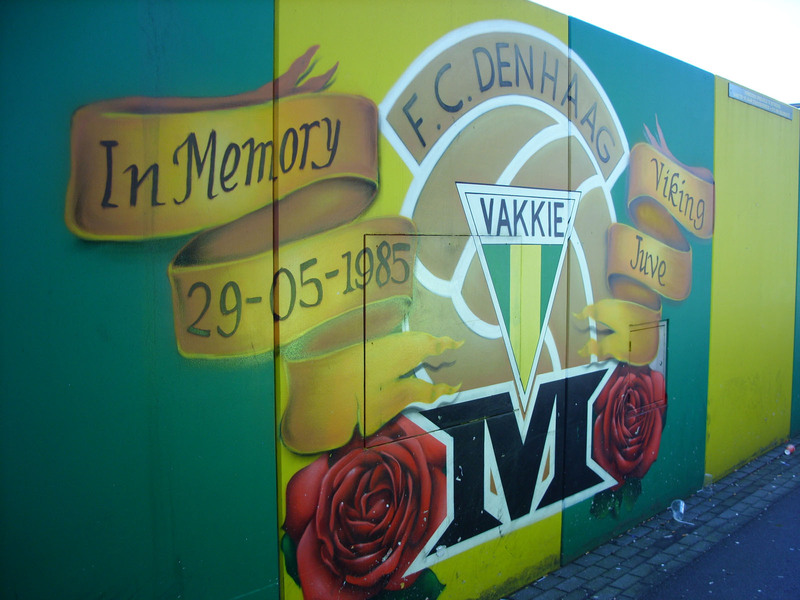 February 17, I visited ADO Den Haag-Heerenveen (2-1) ; nice weather, fanatic Vak M , beautifull scarves in the fanhome and impressive graffiti in the stadium. FC Utrecht fanclub True Support issued a special scarf for their 'Club van 100' members ; FC Utrecht , Home of True Support. The editor of the True Support magazin and FC Utrecht pin collector Jasper Oostlander brought a very special scarf with him from Malaga, showing the Malaga players in a huddle. At the end of the month, I did receive a mail from Ben Visscher, collector of patches of dutch footballclubs and patches of clubs located in Spanish speaking countries. Ben did send me a Portugal country scarf and a FC Zwolle - FC Twente match scarf. In exchange I hope I will be able to buy some patches for him at the football collectors fair in March. The first day of December I visited the Footballcollectors fair in Valkenswaard and bought some 30 years old scarves of Liverpool, FC Den Haag, Borussia Dortmund, Dundee United and AC Milan. 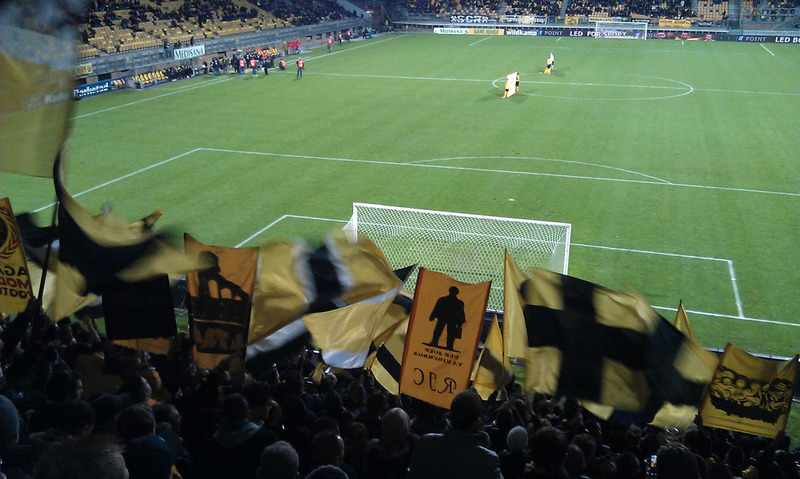 December 15, I visited Roda JC - NAC. Roda has a strong scarf culture, and despite the bad results of this season the fans are loyal to club and team. Just before the match I met Bas Werry, the man behind the supply of many Roda Ultra scarves. Thanks to Bas I could add the following scarves to the collection : Torquay United, Quick boys, FC Basel, Olympique Lyon and 2 Roda Ultra scarves. This month I exchanged again some scarves with Vlassis Giakis, thanks to him the first scarf of a club from Albania is in the collection; FK Tirana. Vlassis did visit the derby Red Star Belgrade - Partizan in November (lucky man..) and bought in the city a scarf of OFK Beograd, the third club in Belgrade.The third scarf he did send me was a scarf of PAS Giannina, a club playing in the Greece Super League. Just before the match FC Utrecht - Ajax at December 23, I exchanged the Mihai Nesu scarf for the Aston Villa 1981 champion scarf with United fan Steve Uiterwaal and friend Wolter Meijer brought me a MVV Maastricht bar scarf. 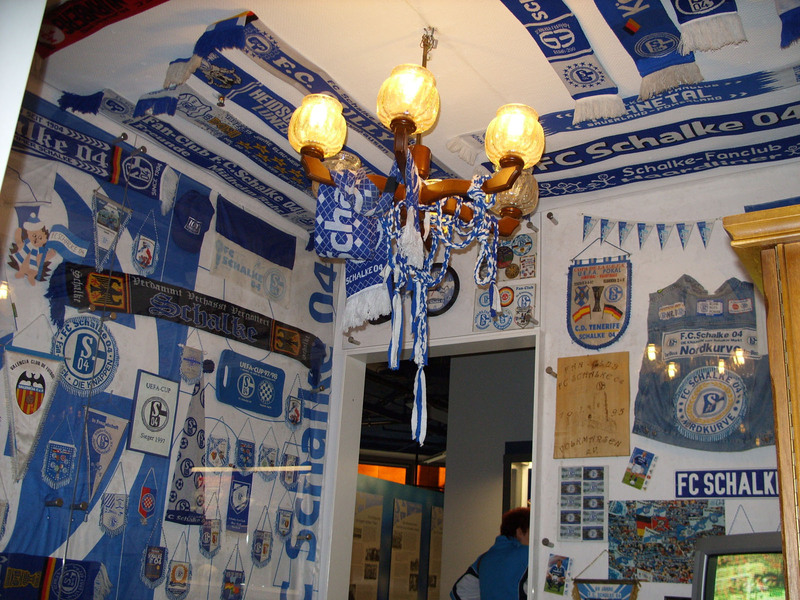 One of the Scarf Collectors Holland members, Marco Remijnse, is focusing now on Dutch and German clubs. 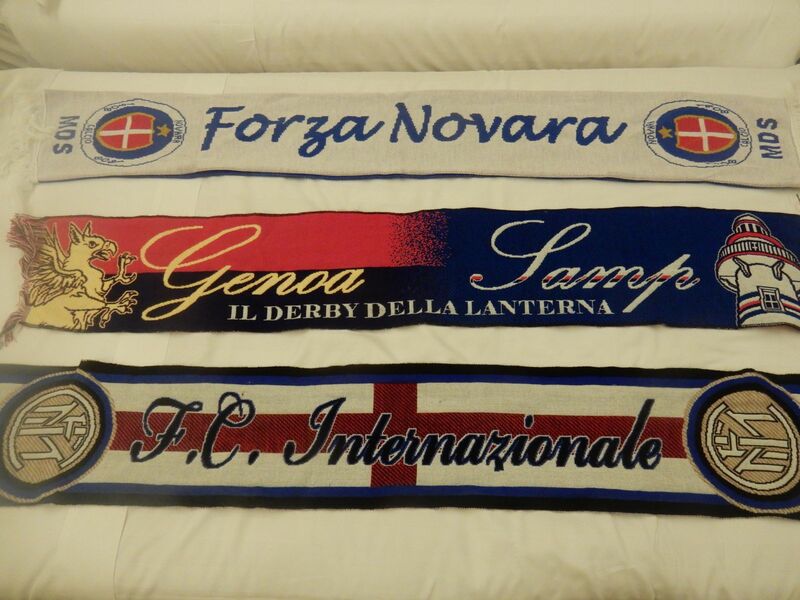 Scarves of clubs from other countries are now switching from his collection to the collections of other members. In my colllection are now scarves from Argentina : Estudiantes, Independiente, Gimnasia, Chacarita Juniors and Racing Club. From Brasil : Bahia, Cruzeiro and Palmeiras. From Chile : Universidad de Chile. From Colombia : Santa Fé. From Venezuela : Carabobo and from Paraguay : Cerro Porteno. Due to the bad weather ( I am making pictures of the scarves outdoor) pictures of these scarves will be shown on the site in January. In November Azreen Abdul Ghafor did send me scarves of the Malaysian clubs Perak, Kelantan and a country scarf of the Singapore U 23 team ; the young lions. Aris Saloniki fan Vlassis Giakis added two clubs from Greece to the collection : Skoda Xanthi and Atromitos. My fysio Roel Zeypveld visited his daughter and just born granddaughter in Seattle and bought a Seattle Sounders scarf , this year MSL semi-finalist in the USA. My brother in law Jan Smit visited Chelsea - Manchester United and bought a special fleece scarf of Chelsea issued on the occasion of their Champions League victory. Pictures of the scarves will be shown on the site in December. Beginning of October I did visit the footballcollectors fair, I bought some pennants for Alberto Javier from Merida, Venezuela and dutch club scarves for Azreen from Malaysia, both will send me some scarves in exchange in November. Wim Boels and Kris van Elst from Belgium were also present. Like last time they brought scarves with them which were difficult to refuse. The following scarves of clubs not yet in the collection were added : Reims, Valenciennes, Cordoba, Antalyaspor and Syrianska. Besides these scarves country scarves from Catalunya, Togo, and Malta are now in the collection. In October I received a mail from Vlassis Giakis, scarf collector and fan of Aris Thessaloniki. His site you can be found under 'links'. We did exchange scarves of our favourite teams, F.C. Utrecht and Aris. The first of September, Scarf Collectors Holland had their fourth trip and we visited Velbert - Fortuna Köln and Dessel - Westerlo. For pictures and small trip report see under About - Scarf Collectors Holland. Scarves of Velbert and Dessel were added to the collection that day. During September I exchanged scarves with Azreen Abdul Ghafor from Malaysia. I did send him the new F.C. Utrecht scarf of this season and he did send me two country scarves of Malaysia. Franck Laine from Annecy added a scarf from Evian to the collection and in exchange I did send him a F.C. Utrecht scarf as well. Via Internet I was able to add scarves from countries not yet in the collection like a club scarf of Al Ahly from Egypt and country scarves of Kosova and Syria. September 22 , I visited Arthur van Twillert and family and in the afternoon we saw the number one derby of all derbies in Holland : IJsselmeervogels - Spakenburg, today at the Spakenburg ground (See picture below). A special derby scarf (See Scarves - Other) and an even more special Vogels scarf are now in the collection. August 20, dutch second division club Veendam invited all Kolonicio's (Veendam donors) for the first match of the new season against Eindhoven. Together with my son-in-law Frank I visited the game. We drove 400 km (!) that evening but had a great time. Good weather, good atmosphere at the stands and in the fanhome (see picture) and two teams going for three points. Score was 1-0 but could have been 5-5. Besides the 'Kolonicio'-shirt I bought the SC Veendam scarf. During our holiday in Switserland, last summer we met Marion and John Simms from South Africa who made the same train journey. I told sport fanatic John about my collection and in August I received a package from Johannesburg containing scarves of the two famous clubs of that city; Kaizer Chiefs and Orlando Pirates. A great gift because there were no South-African teams in the collection yet. The last scarf added to the collection in August is the match scarf Liverpool - AC Milan (1-2) added by belgium Borussia Dortmund fan Gregory Demeyere. June 2, me and my family visited the friendly Holland - Northern Ireland (6-0), the last match before the European Championship. Good atmosphere in and around the stadium and I added the match scarf to the collection. In June I exchanged again pennants for scarves with Alberto Javier Del Cura from Merida, Venezuela. Alberto Javier did send me scarves of Boca Juniors, Cucuta (Colombia) and Caracas. A member of the Scarf Collectors Holland, Marco Remijnse decided in June to decrease his collection and most of the other members took over some scarves. For me the opportunity to add scarves of clubs from countries which are not yet in the collection like Dinamo Tbilisi (Georgia), Alnasr (Lybia), Valletta F.C. (Malta) and Pakhtakor Tashkent (Uzbekistan). In July we spend our holiday in Switserland and Austria, it was not easy to get football scarves in these countries but in Austria we were able to buy scarves of Sturm Graz, Rapid Wien and Austria Wien when we visited their fanshop. Pictures of the scarves will be shown on the site in August. 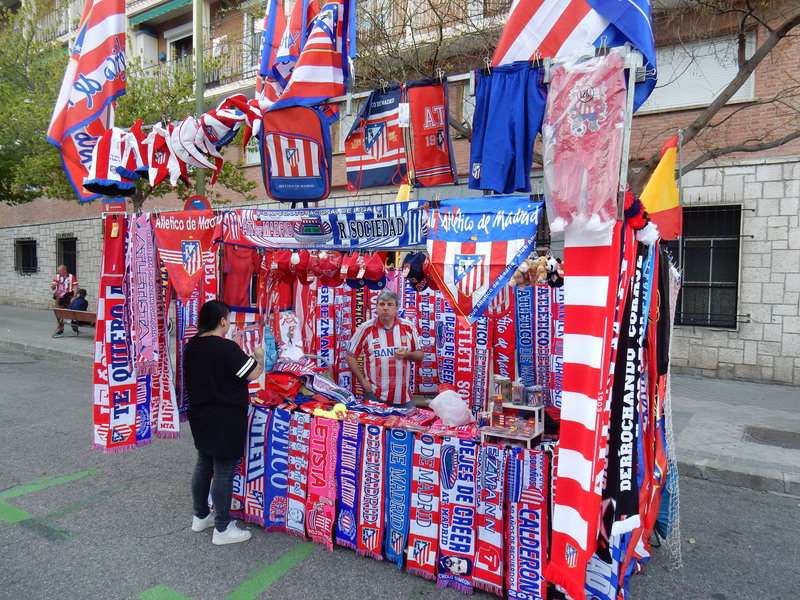 May, month of the finals...Hubert Buter visited Atletico Madrid - Athletic Bilbao in Bucurest and bought two match scarves for me. Together with his friend Mihnea Vlad he did also visit the stadiums of Rapid, Dinamo and Sportul and bought scarves of these clubs. Mihnea added a scarf of Aris Salonika to the collection. In May I completed the Bundesliga for this and next season by buying Augsburg and Furth on E-bay. On the exchange pages of Jelmer and Wouter I found Carl Zeiss Jena, Padova , Apollon Limassol (First scarf from Cyprus) and Rakow. Football Heaven is still selling football souvenirs via their internet shop but a lot of the scarves they are offering are out of stock. But because they are located in Scotland they have a wide range of scarves from England,Scotland and Ireland. I added scarves of Dundee United, St Mirren, Motherwell, Livingston, Kilmarnock and Dunfermline to the collection. Saturday April 7, the Scarf Collectors Holland had their third football trip. This day we visited 1. 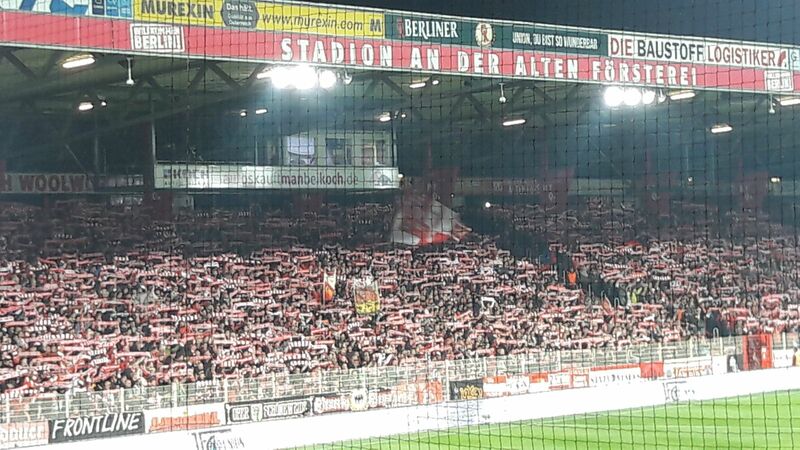 FC Köln - Werder Bremen and Seresien - Ciney in Belgium. At the beginning of the day we exchanged scarves at our meetingpoint. From Ronnie Landheer I got scarves of Hapoel Tel Aviv, Sporting Portugal, Liverpool, Genua and Celtic. From Sybrand Andringa I got two Liverpool scarves and from Jelmer Boots scarves of Bnei Sahknin, Algeria, Celtic, Rubin Kazan, Ebbsfleet and Red Bull New York. Before we drove to Köln we visited scarf manufacturer TIFO. I could add scarves of Veendam, Feyenoord, KSC Oosterzele, ADO Den Haag, Portugal, F.C. Utrecht, Everton, F.C. Twente, Galatasaray and Turkiye to my collection. 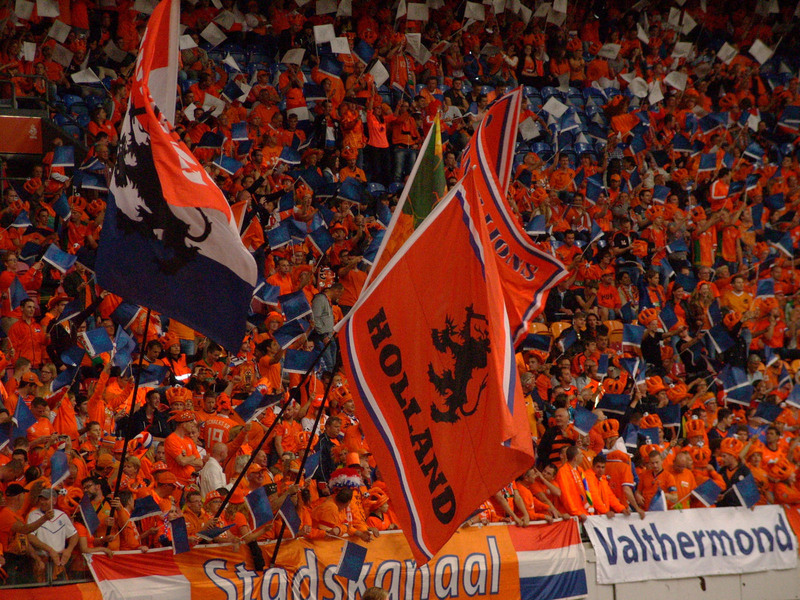 For a trip report and pictures, click on the home page on the picture of the Scarf Collectors Holland scarf. Saturday March 3, I visited the collectors fair in Houten. Thanks to super collectors Wim Boels and Kris van Elst from Belgium I was able to add a lot of scarves to my collection. Besides Ultra - scarves from Besiktas, Benfica and Malaga, and a country scarf from Thailand, the following European clubscarves were added to the collection : Levski Sofia, Waldhoff Mannheim, Jelenia Gora, Pogon Szczecin, Wisla Krakow and Viktoria Zizkov. Last month I could add the first clubscarves from Columbia to the collection. Wim and Kris added the first club scarf from Mexico (Atlante Cancun) and the first six clubscarves from Thailand to the collection : Khonkaen FC, Muangthong United, Pattaya United, Samutsongkhram FC, Sriracha F.C and Surin F.C. A week later, I visited the match Dusseldorf - Aue (3-1) with friends Wolter, Rob and Peter and bought a scarf of the hometeam. 35.000 people, good stadium, excellent atmosphere and most of the fans wearing my favourite fan attribute : a scarf. In February the first scarf of a club from Colombia has been added to the collection. Alberto Javier Del Cura from Merida, Venezuela and myself are exchanging pennants and scarves. Besides a scarf of Nacional Medellin, Alberto Javier did send me scarves of Cucuta Deportivo (Colombia) and Trujillanos (Venezuela). On the way back home from FC Oss - Cambuur I met PSV fan Peter Duin who had visited PSV - Vitesse the same evening. A few days later he offered me a Newcastle United scarf, a PSV - Lazio match scarf from season 2001 / 2002 and a PSV scarf issued after winning the European Cup in 1988. Later that month I could add two old F.C. Utrecht scarves to the collection thanks to F.C. Utrecht fan and collector Marcel van Wolferen. At the end of the month I celebrated my birthday and besides a F.C. Utrecht scarve Riet gave me a very special 'ROB - 50 jaar' scarf which took her a lot of time to knit it. Hunor Miklos from Hungary did send me several mails in the previous months with the question to exchange the Chievo Verona scarf in my collection. This month I did send him the Chievo scarf and a F.C. Utrecht scarve and in exchange he did send me an other Chievo scarf and the special Jean Paul de Jong player scarf issued at his last match for F.C. Utrecht. That scarve was already in my collection but I could pass it on to Jasper Oostlander, who was already looking for it for a long time ,everybody happy and JP is back home after a journey to Hungary ! 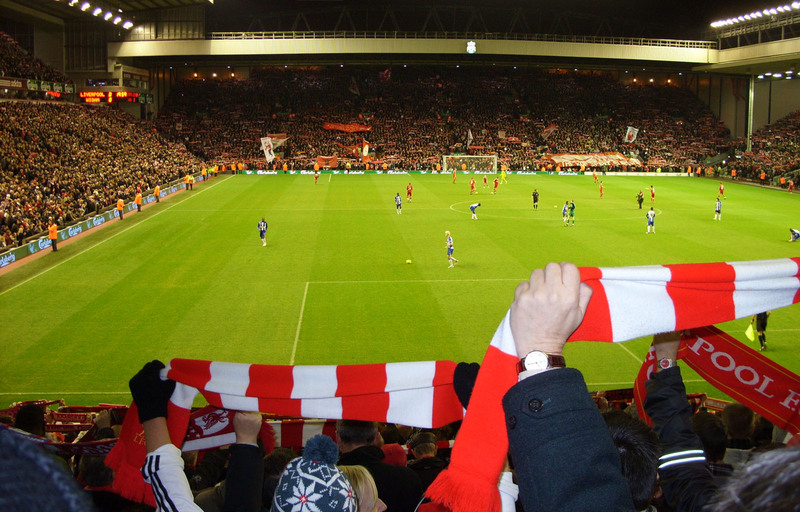 Pictures of the scarves mentioned in the February newsletter will appear on the site in March. New release of site ! This month the new site has been released. On the homepage it is possible to search for a club or country scarf, to vote on the Poll question and to link easily to scarves of F.C. Utrecht, Liverpool, Celtic, Borussia Dortmund and other club scarves. Credits to Wim van de Gein who did a great job regarding development and design. Additions this month : thanks to Patrick van Tergouw I could add two F.C. Utrecht scarves to the collection, one of them is from the seventies. In January I visited two games in the Jupiler League, the second division in the Netherlands: FC Dordrecht - Telstar (2-0) and FC Oss - SC Cambuur (3-2). Scarves of the home clubs have been added to the collection which means that the collection contains scarves now of all Eredivisie and Jupiler League clubs. In a souvenir shop in the centre of Amsterdam they are selling football scarves of the major clubs in Europe but to my surprise they had also Bangor (Northern Ireland), LASK Linz and a country scarf of Israel. December 17, I took the train to Osnabruck for visiting the match VFL Osnabruck - Darmstad (4-1) in the third Bundesliga. Good atmosphere in the city and in the stadium and the level of the game was not bad at all. Equal to bottom Eredivisie in the Netherlands.Before the match I visited the fanshop in the centre of the city and I bought a VFL bar scarf and an 'Ostkurve' - scarf. Amazing to see how big and well organised this third Bundesliga club is. At the end of December Diego Sanchez Mullor from Alicante did offer me a lot of Spanish scarves. For me this was the chance to complete the Spanish Primera Division in my collection and to add some scarves of clubs which played in the Primera Division in the past. Just before yearend I received the package with scarves of Albacete, Almeria, Burgos, Elche, Extremadura, Gimnastic de Tarragona, Granada, Hercules, Levante, Linares, Merida, Rayo Vallecano and Salamanca. Good progress have been made with the revision of the site. Within a couple of weeks we will go 'live'. In November I bought the pink 'away' F.C. Utrecht scarf for Sybrand Andringa and he added scarves of Luxembourg, Brno, Terrassa and Lleida to the collection. At the football collectors fair in Valkenswaard I could buy the Ajax Champions League final match scarves from 1995, Ajax - AC Milan and 1996, Ajax - Juventus. Besides these two scarves I could buy scarves of Monaco,Feyenoord and the match scarf Feyenoord - Freiburg from 2002. In exchange for pennants of dutch and european clubs Alberto Javier Del Cura Delgado added some beautiful scarves of clubs from Venezuela; Deportivo Tachira, Deportivo Lara, Alberto's club Estudiantes Merida and Caracas. The coming months the homepage of the site will be changed considerably, Wim van de Gein the man behind the 'technics' of the site is making good progress and the new homepage will be ready early 2012. Beginning of October I visited the football collectors fair in Houten. At the fair F.C. Utrecht fan Hubert Buter was selling football souvenirs and thanks to him I could add two F.C. Utrecht match scarves to the collection; AGOVV - F.C. Utrecht and Liverpool - F.C. Utrecht. Another F.C. Utrecht fan and collector Jasper Oostlander brought an old scarf of our favourite club with him. Jasper is collecting F.C. Utrecht match pins and F.C. Utrecht match scarves. See links for his site. From other people I bought the following scarves at the fair : match scarf Urkrain - Netherlands, Benfica away, Belarus, Cluj, Bodo/Glimt, Riverplate, St. Johnstone, Sporting Lissabon, LKS Lodz and Amkar Perm. 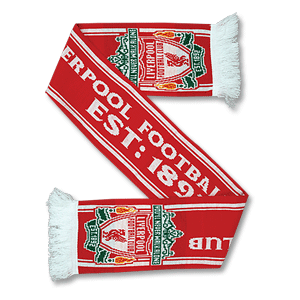 Later in October I finally could buy via Internet the 'Invasion of Liverpool' scarf , the seventh(!) Liverpool - F.C. Utrecht match scarf in the collection. The month September is normally a relative quiet month just after the holiday but not this year. Approximately 30 scarves are added to the collection this month. From internet sellers I bought the following scarves : San Marino, four F.C. Utrecht scarves , the official Feyenoord 2003 Uefa-cup final scarf, a scarf issued when Ajax won the champions league in 1995 and the match scarf Celtic - Porto. Also this month Jelmer Boots received a big package with scarves from Alberto Javier Del Cura Delgado from Merida, Venezuela. Most of the Scarf Collectors Holland had no scarf from Venezuela in their collection. Thanks to Jelmer and Alberto Javier the Venezuela Country scarf and club scarf Zamora have been added to the collection. Besides the first club from Venezuela, the first club from Belarus is new in the collection; Bate Borisov. Jelmer added this scarf to my collection together with scarves from the Brazilian clubs Fluminense,Internacional,Gremio, and Avai FC, Levski Sofia from Bulgaria and Braintree Town of which club he visited a game in England. Jelmer Boots is also the driving force behind Scarf Collectors Holland. September 17 we had our second trip. 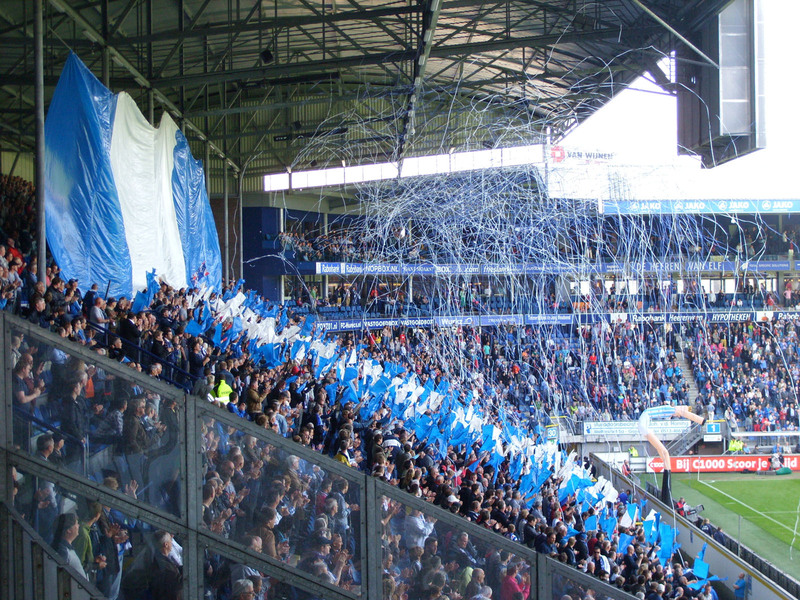 In April this year we visited Wuppertal - Elversberg and VVV - Heerenveen. This day we had an even more busy program. In the morning we visited a scarf manufacturer in Brabant and we felt as children in a candy store. The owner gave us the opportunity to buy some scarves for a very reasonable price and we were all able to add some scarves to our collections.Scarves of AGOVV, Red Army(Antwerp), Cercle Brugge, Litex Lovech, Botev Plovdiv, Paok Saloniki, Sampdoria, Goztepe and scarves of the polish clubs Jagiellonia, Miedz Legnica, Jedlicze, Szombierki was the result after a small hour. The following stop was Duisburg where we visited MSV Duisburg - Union Berlin. Most of us bought a scarf of the home team. The game ended in a draw, thanks to a 'lucky' penalty given to the Zebra's, Union was the better team. Weather, beer and Bratwurst were great, game average and fans enthousiastic but less agressive than the fans in Holland which have less flags but are showing more commitment with the game. After the match we travelled another 180 km to Antwerp and made a stop in Turnhout to visit the stadium of KV Turnhout, unfortunately the people from the club had no scarves they could sell us.After half an hour we were on our way again to Het Kiel. In this part of Antwerp Beerschot AC is the local club and they were playing against Zulte Waregem tonight (2-0). Both clubs are not top teams in Belgium but the level of the game was very high compared to MSV-Union but also to games we have seen in Holland this season. Atmosphere around the stadium was typical english; stadium squeezed between the houses and pubs around the stadium where the fans are meeting each other before and after the match.Good atmosphere in the stadium during the match with good support from the Armata Viola. Fully packed with scarves we drove back to Holland after a geat day. Looking forward to the next trip ! Last but not least I exchanged this month some scarves with Sybrand Andringa and Wouter Snall, both Scarf Collector Holland. New in the collection : Perugia, Mantova, Ujpest and two Liverpool scarves.October is waiting starting with the Football Collectors Market in Houten at the first of October. When the football season is over it should be a quiet period for a football scarve collector but not if you are visiting Poland. On our way to this country we visited Berlin as well. In a souvenir shop I could buy Dynamo Berlin and a DDR (!) country scarf ,not an original from the the seventies or eighties but still welcome.In Poland we stayed in all big cities and besides some beautiful friendships scarves (three clubs on the scarve instead of the standard two clubs friendship scarve) I bought two Eurochampionship 2012 scarves.Club scarves of the following clubs were added to the collection in Poland: Arka Gdynia, Cracovia, Garbarnia, Hutnik, Jagiellonia, Korona Kielce, Lech Poznan, Lechia Gdansk, Odra Wodzislaw, Polonia Bytom, Ruch Chorzow, Slask Wroclaw, Stal Mielec, Widzew Lodz, Wisla Krakow, Zaglebie Lubin, Zakopane and Maccabi Tel Aviv(!). Polish footballfans are fanatics and they are expressing this with their scarves, so plenty opportunities for collectors.During our trip we visited fanshops of Lech Poznan, Lechia Gdansk, Slask Wroclaw and the stadiums of Cracovia, Wisla Krakow and Polonia Warszawa. On our way back to the Netherlands we visited Dresden and the stadium of Dynamo Dresden, the 'sleeping giant'. In their beautiful fanshop two scarves were added to the collection. Back in the Netherlands I exchanged some holiday scarves with Aaron van Maaren (See links for his site) who visited Bosnia and Herzegovina this summer.Besides scarves of NK Celik and NK Iskra, Aaron added country scarve Togo to the collection. Since I am collecting football scarves, friends, family and colleagues who are visiting foreign countries are surprising me with scarves. In July, colleague Stefan Holla visited family in Ukrain and brought a scarve of Dnipro Dnipropetrovsk (UEFA-cup opponent of FC Utrecht in 2004) to the Netherlands. Beginning of this month, I got a mail from Kevin Daems living in Geel, Belgium. Besides some scarves from the Belgium clubs Seraing, Racing Mechelen, Lierse SK, KV Mechelen, Waterschei Thor, Linda Olen and Germinal Beerschot he offered me some scarves from the Russian clubs FC Ural, FC Moscow, Saturn, Chelyabinsk, Krylia Sovetov Samara, Kuban Krasnodar, Luch-Energiya.The text on the Russian scarves is in Cyrillic, not the easiest language.The total package I took over from him is a beautifull extension of my collection.The other scarves in the package are Wrexham, Mandalskameratene Norway, Helmond Sport, Go Ahead Eagles, Hearts, Timisoara, Slavia Sofia (first Bulgarian club in the collection), OFI Kreta, PAOK Saloniki and Panathinaikos.Steaua Bucuresti fan George Ilinca did send me a mail and did ask me if it was possible to get the scarf of Mihai Nesu who broke his neck in May during a training session and has been removed to a revalidation centre where he is working on his recovery. My mother heard about the request and we did send him her Miha Nesu scarf together with the European League match scarf F.C. Utrecht - Steaua. In exchange he did send me a country scarf of Romania,one of the last missing European countries in the collection.Under 'Links' you can find the link to George's site. Tuesday May 10, F.C . Utrecht player Mihai Nesu broke his neck during a training session. As it looks now, it will be the end of his career and it is very uncertain if he will fully recover. A tragedy for Mihai, his family, club and fans. 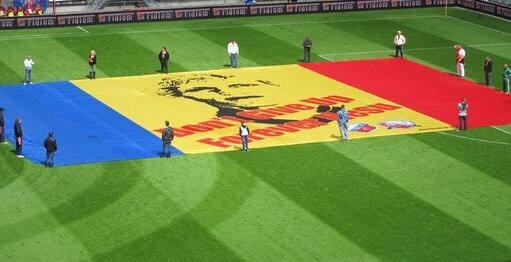 Before the match against AZ a big Romanian flag with his picture was laid down on the pitch (see picture), fans were wearing scarves with the Romanian flag colours and his picture and players wear T-shirts with the same design. Additions this month : Ulm, Union Berlin, Dundee, Cadiz, Hibernian, Gretna, F.C. Utrecht - Liverpool Bunnikside scarf, F.C. Utrecht - Napoli scarf, Houten, Utrecht City Saints, the Mighty Mike - Michael Mols scarf and the Champions League final scarf Barcelona - Manchester United. Beginning of March, I visited the football collectors fair in Houten.Collector Hubert Buter added the following special scarf to the collection: an USSR scarf from 1989. Besides this scarf he contributed scarves of Austria Wien, Polonia, Bedworth and Celtic. 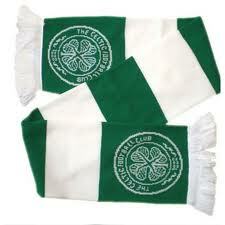 From other collectors I bought a matchscarf of Celtic-F.C. Utrecht (scarf number 5 of these for F.C. Utrecht historical matches) and scarves of Greece and the match Netherlands-Finland. With Sybrand Andringa I exchanged F.C. Utrecht scarves for scarves of Gornik Zabrze and Universitatea Craiova. Later in the month Dennis Mandic contacted me because he has decided to stop collecting scarves.Besides scarves of Paderborn, Hajduk, Borussia Dortmund, VVV and Champions League final 2009 Manchester United - Barcelona I took over three Feyenoord match scarves.The matches are the home matches for the Uefa-Cup 2001-2002 against Rangers, PSV and Inter Milan.The scarf of the final against Borussia Dortmund was already in the collection.In March the regional TV and Radio station made an item about my collection and asked me to show the scarves. It took me some time to prepare the item . Since summer 2010,no country scarves have been added to the collection but thanks to Jelmer Boots, a scarf of Bangladesh has been added this month.Besides this scarf, he added one of Slatina(Romania) to the collection. From another Holland Scarve Collector, Wouter Snall I could get scarves of Piacenza, Cliftonville and Dinamo Bucharest.The first club of Slovenia is now in the collection : NK Maribor.With César Freitas from Porto I exchanged a Portugal scarf for a Coimbra scarf. César has a collection of more than 120 Portugal scarves but found one on my site not yet on his collection.For my birthday ,my son Kevin gave me the orange-black FC Utrecht-away scarve of this season. Under 'links' the site of Sunderland fan Ian Holmes can be found http://tvfootballscarves.weebly.com/ ,visit the site and enjoy the video under 'BBC TV Scarves' ! January 2011 was a quiet month, not a surprise after the roller coast program of my club F.C. Utrecht during August-December 2010. Colleague Tatiana Menchikova gave me a match scarf of the match Netherlands-England played in August 2009.Roda JC fan Bart Elders added three Roda JC scarves and a Forza Juve scarf to the collection. 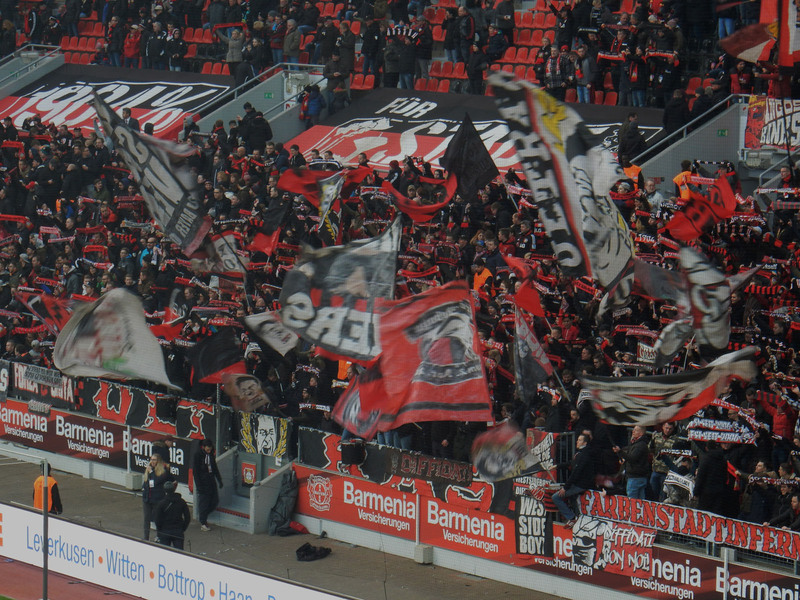 Last week of January I was in Hamburg and able to buy two Sankt Pauli scarves in the Fanshop at the Millerntor stadium. With 4000 other F.C. Utrecht fans, I attended the Europe League match Liverpool - F.C. Utrecht together with my son Kevin ,son-in-law Frank and friend Wolter. Allthough the match was a friendly because of earlier results in the poule the whole trip was an unforgettable experience. Besides the match we did the Everton stadium tour at Goodison park and the Liverpool experience; visiting Anfield and the Liverpool museum. It was a beatiful end of the European campaign with 4 wins,6 draws and 2 losses.Under scarves ==> F.C. Utrecht you can find the match scarves of the matches against Liverpool. Besides the match scarves, I also bought an Everton scarf in the Everton fanshop and a 'You never walk alone' - scarf at Anfield. 5 years ago, 29 november 2005, F.C.Utrecht player David di Tomaso died after an heart attack in his sleep at a age of 26. His last match was on November 27,a victory against Ajax (1-0), F.C.Utrecht's main rival. 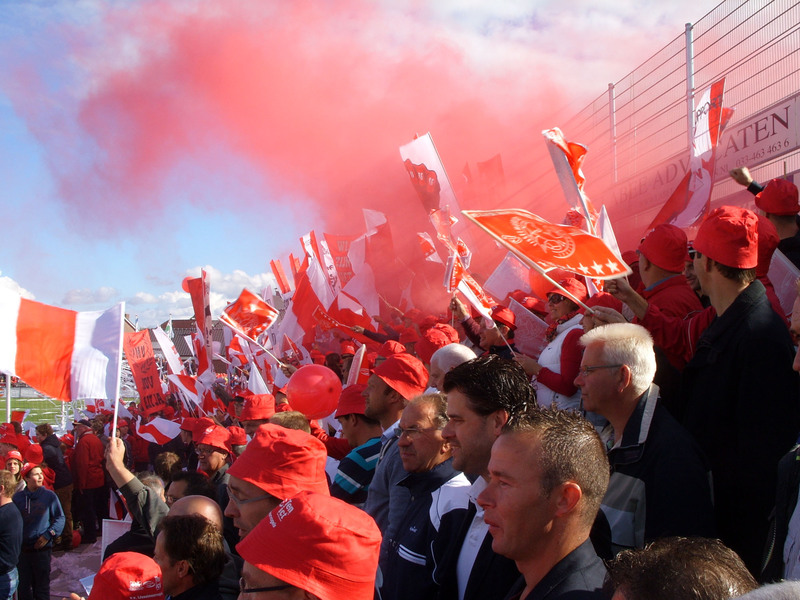 On December 1, 2005, a meeting of supporters at Stadium Galgenwaard was held, to honour Di Tommaso (DiTo for short). At least 14,000 fans showed up (See picture). Among the speakers were coach Foeke Booy and captain Jean-Paul de Jong. Besides Di Tommaso's relatives and FC Utrecht's main squad, all of the clubs' youth teams were among the visitors. They were told that number 4, the number worn by Di Tommaso, would be retired from use. Sedan, Di Tommaso's former club, had already announced that number 29, the number Di Tommaso used when he played for the club, would be retired. Since 2006 the player of the year award is called the Di Tommaso trophy in honour of David Di Tommaso. The trophy is voted for by the fans.Pictures of the December 1,2005 meeting will be on the home page in December and after this month, they can be found under 'Pictures'. Additions to the collection this month : Hubert Buter visited Steaua Bucuresti - F.C.Utrecht and brought two scarves back to Holland; an Europa League scarf showing the logo's of Liverpool, Napoli, Steaua and F.C. Utrecht and a Steaua scarf. With Sybrand Andringa I exchanged two F.C.Utrecht scarves for scarves from Emmen,Omniworld and F.C.Groningen. Colleague Berry van der Haring gave me some PSV club and match scarves, a Sevilla - Middlesbrough match scarf and a Manchester United scarf. Saturday October 2 , i visited the football collectors fair in Houten again and added scarves of the following clubs to the collection: Skalnik Gracze(Poland), Argentina, Borussia Dortmund, Werder Bremen, Liverpool, Millwall, Auxerre, Ireland, Juventus, Go Ahead, Volendam, Sevilla and F.C. Utrecht. Hubert Buter, also present at the fair, enabled me to obtain another (the fourth) Celtic - F.C. Utrecht match scarf. October 12 I saw the dutch national team beating Sweden with 4-1, a lot of fans from Sweden bought the match scarf but I was lucky and could also get one. Before the match F.C. Utrecht - Steaua, the official match scarves were sold out but the day after the match I could buy it in the fanshop in the centre of the city together with the official F.C. Utrecht - Napoli scarf. At the last day of the month I bought via Internet an old F.C. Utrecht scarf from 1997. After the two matches against Celtic in August, another giant and my favourite English club Liverpool visited F.C. 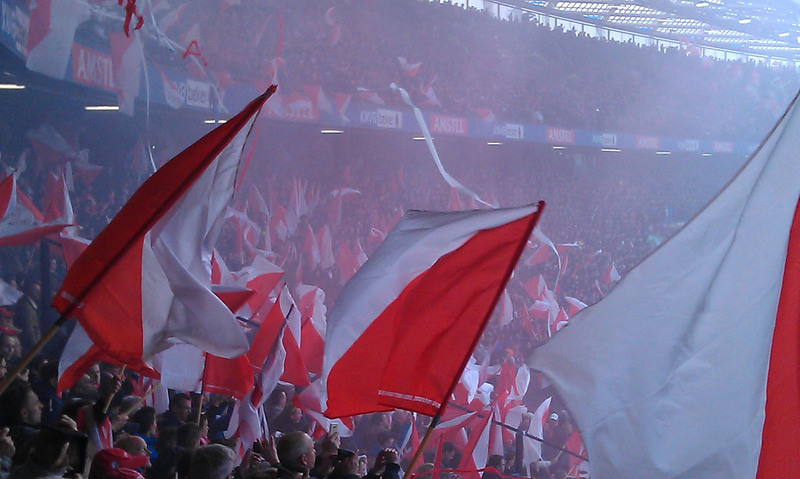 Utrecht at 30 September, again an historical match for the club. The two match scarves of this match can be found under Scarves ==> F.C. Utrecht. Other F.C. Utrecht European match scarves added to the collection this month : Auxerre(2003), Grazer AK (home and away - 2001), Legia Warschau(2002), Napoli (2010), Steaua Boekarest(2010) and a scarf with the logo's of the clubs of European League 2010 Poule K ; Liverpool, Napoli, Steaua and F.C. Utrecht. With F.C. 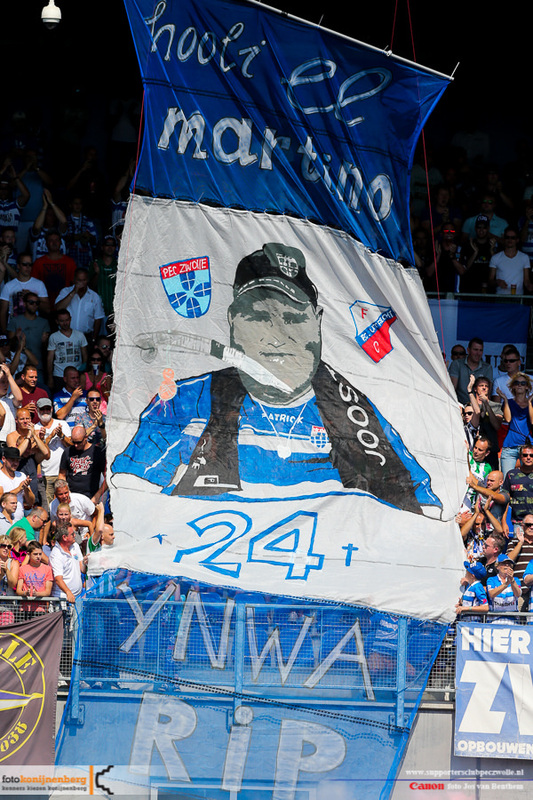 Twente fan Marcel Cerri I could exchange F.C. Twente scarves, in my collection is now the 'You never walk alone' scarf which could be bought when the club celebrated the 40 years anniversary in 2005. We met each other before the competition match F.C. Twente - Groningen (4-2 ,very good atmosphere in the stadium and impressive support by the Twente fans). Under 'Links' you will find the link to Marcel's site. After buying the Blackpool scarf via Football Heaven the premier League is complete again. At August 19 and August 26 F.C. Utrecht played 2 historical matches against Celtic. 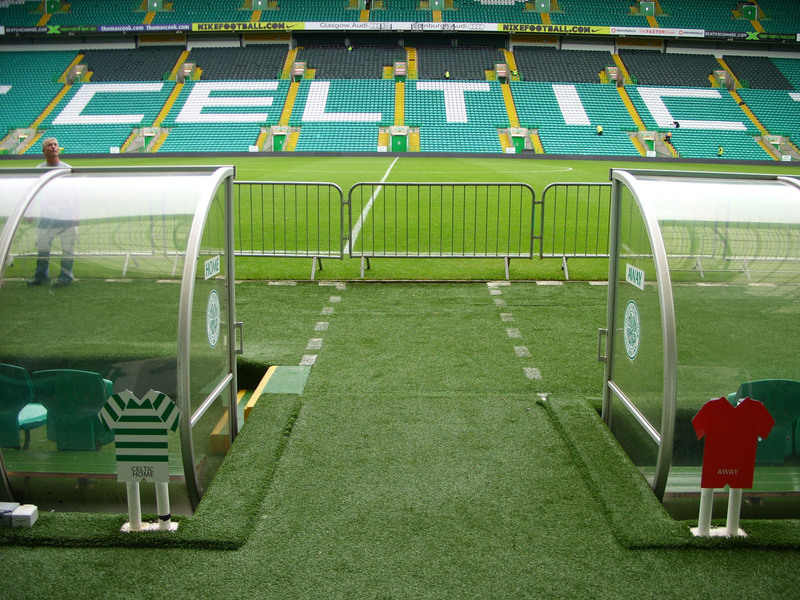 After 4 domestic play-off games and 2 qualification rounds, the final hurdle to the Europa League was Celtic. 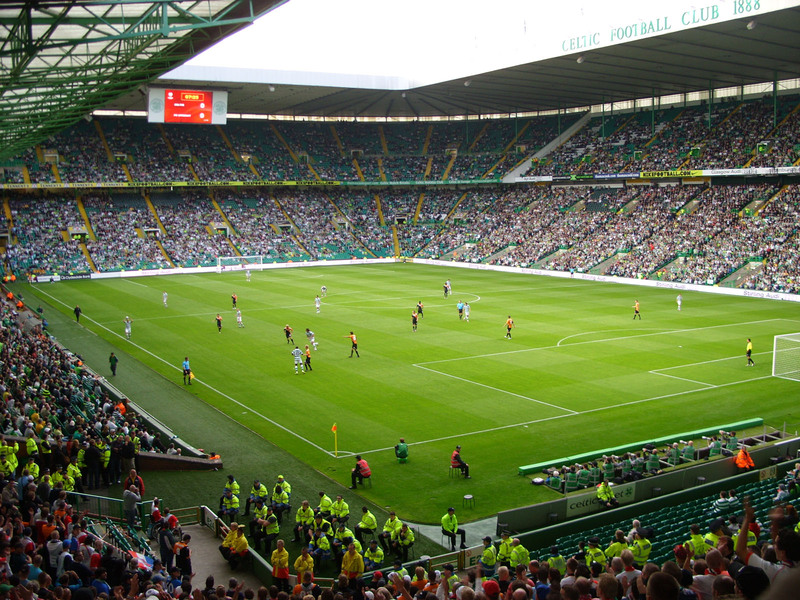 Together with another 1,500 fans I saw the match at Celtic Park (2-0 loss) on August 19 and bought a Celtic - F.C. Utrecht friendship scarf and a Celtic 'you'll never walk alone' scarf at Celtic Park. The next day I visited the stadium and did the stadium tour and bought a 'Hoops' scarf in the fan store . Both match and tour were an unforgettable experience. Nobody in the world did foresee the 4-0 victory a week later at Galgenwaard. You can find 2 match scarves and the friendship scarve under Scarves==> F.C. Utrecht. In the next round we will play Steaua, Napoli and Liverpool.... Earlier this month, I added 2 Celtic scarves and scarves of Bournemouth, Cambridge United, Northampton Town, Liverpool, Spurs and Galatasaray to the collection after visiting Jelmer Boots site. Just before the F.C. 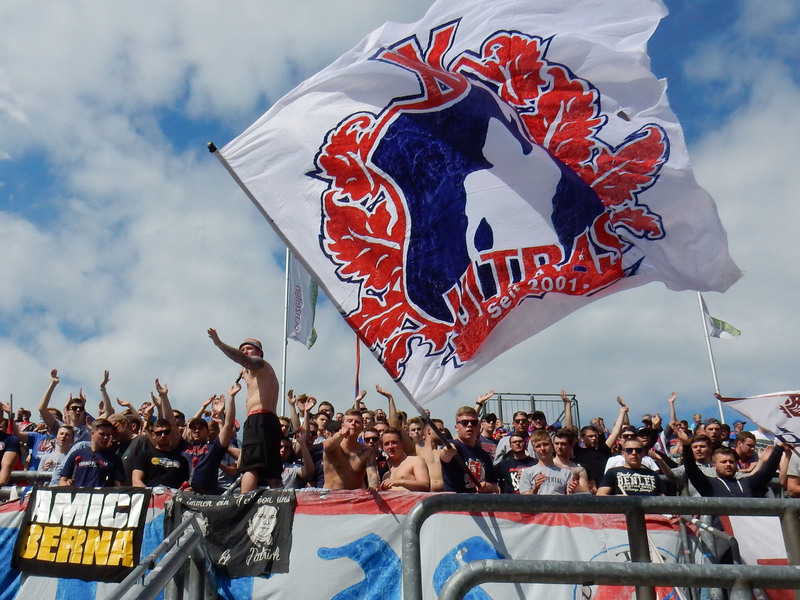 Utrecht - Willem II game, F.C. Utrecht fans Paul and Mandy surprised me with a Wigan Athletic scarf, which is very difficult to get. One country scarf has been added this month : South Africa, a gift from André Conradie, a colleague of my brother in law Jan Smit. Some changes of the homepage have been implemented this month. Because of the number of F.C. Utrecht scarves , these scarves have a specific option under scarves from now on. The F.C. Utrecht scarves will not be shown under clubs anymore. Another change is that from now on the pictures on the homepage will be changed on a regular basis. Because of the upcoming clash F.C. Utrecht - Celtic for the play-offs European League pictures of these clubs will be shown this month. Just returned from a journey in Canada. Scarves from soccer clubs are difficult to get. Ice Hockey is and will be the number 1 sport over there. In Toronto I was not able to find a Toronto FC scarf but in Vancouver in a shop where you are not expecting that they are selling scarves (Sears) I could buy a Vancouver Whitecaps scarf. In other shops I bought the following country scarves : Tunisia, South Korea, South Africa, Slovakia, Canada and Serbia. Beginning of June, the dutch national team did play their last friendly before the World Championship against Hungary in the Arena. Before entering the stadium I bought the match scarf. Besides this match scarf two other Holland scarfs have been added to the collection. This month I had contact with Jelmer Boots (number 1 scarf collector in the Netherlands),which was a long time ago. He offered two F.C. Utrecht scarfs and scarfs of Macclesfield (England),Trencin (Slowakia) and Gelios(Ukrain) that are now in the collection.After all these years I was finally able to add a scarf to his collection : a 15 year old Heerenveen cupfinal scarf. My son Kevin gave me a country scarf of Poland, my brother in law Jan Smit bought a very unique scarf during a business trip, a country scarf of Lebanon.Pictures of the last two scarfs will be on the site in August. May is the month of the finals. Hubert Buter,one of the directors of True Support (FC Utrecht fan club with around 800 members) saw the Champions League Final in Madrid between Bayern and Inter and bought two match scarves for me. Excelsior will play in the Eredivisie next year,in May I ordered the club scarf via www.jupilerleaguefanshop.nl, a site where you can order fan articles of all Jupiler League clubs.Another Jupiler League club has been added in May as well, colleague Gerard Bakker bought a Telstar scarf for me from fan/sponsor Kapsalon Waagmeester. After Polonia and Legia a third club from Poland is now in the collection : Lech Poznan, bought via Marktplaats together with scarfs from Borussia Dortmund (nr. 8), Nottingham Forest and Heerenveen. (Champions League ) Next month the world championship will be played in South-Africa, cheap scarves ( 2 euro max) can be bought in a lot of shops, I bought one at Intersport. One of my goals is to have all the scarves of the clubs of the main European competitions in my collection.From the premier league I was still missing Hull, Bolton and Wigan. Via www.footballheaven.net I have added Hull , Bolton and Reading to the collection. Only Wigan to go now for the Premier League. Also scarves from Standard Luik and Antwerp could be ordered here. The company is located in Scotland , most of the scarves they have are from the Irish,English and Scottish clubs.They also have a wide range of country scarves. Within three days after ordering the scarfs are in your mailbox and the prices are reasonable. Sybrand Andringa's monthly contribution contains this month 3 special FC Utrecht scarfs (45 in total now), a Maroc country scarf and an old Fortuna Vlaardingen scarf. Total number of scarves end of April : 720. March 3 I visited Netherlands - USA (2-1) and I bought the match scarf of this match, it is still remarkable to notice the different atmosphere during matches of the dutch national team compared to matches of the clubteams.At the football collectors fair in Houten on March 6 I was able to add some special scarves to my collection ; 2 Liverpool scarfs, 2 scarfs from Ado Den Haag,the match scarf of the Champions League Final 1996 - Juventus - Ajax and an old Go Ahead Eagles - B-side scarf. 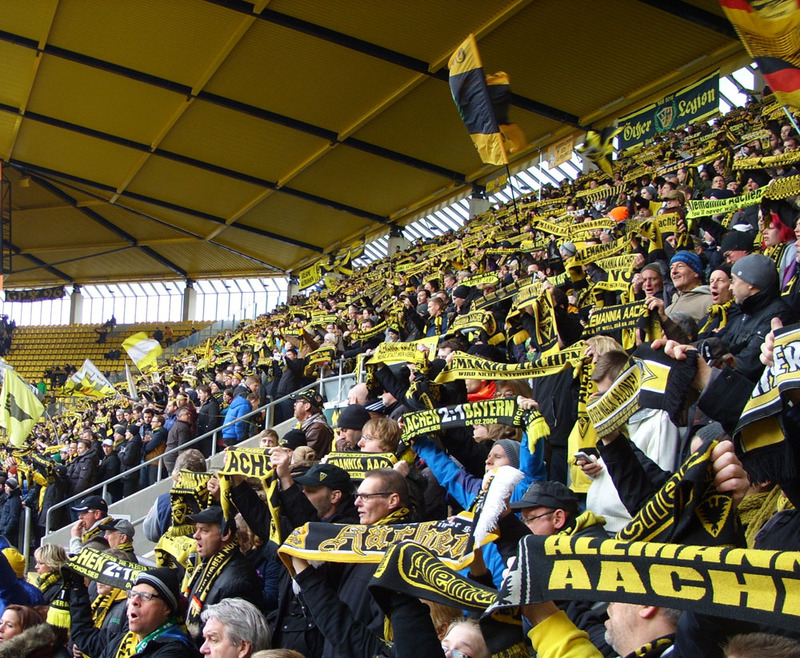 Fan pictures of NAC Breda, Cambuur, Milan and Dortmund have been added. The pictures of Milan and Dortmund have been downloaded from the Ultras-Tifo site, amazing site and worth to visit (www.ultras-tifo.net). In total 56 pictures are now on my site.12 scarves have been added to the collection in February, I visited Ajax - Juventus with colleague and Ajax-fan Johan Willems and bought a USA country scarf, an Ajax scarf and one from Milan. My son Kevin visited Berlin and added a beautiful Hertha BSC scarf to the collection.Finally, thanks to Sybrand Andringa the yellow-blue Cambuur scarf is in the collection. He also offered a special Sparta scarf with the slogan : Sparta naar vóóóóren, that I could not refuse. 2 new F.C. Utrecht scarfs in the collection ,one of them is from 1980 issued for the 10 years jubilee. Because of the number of F.C. Utrecht scarfs (42) a seperate F.C. Utrecht- 'tab' will be created on the site the coming months.Another change will be 'rotating' pictures on the home-page. Fan pictures from Finland, Colombia, Australia and Serbia have been added.In total 52 pictures are now on the site. One of them is the impressive picture of the Hillsborough memorial at the Shankly gates at Anfield. In January I exchanged 20 old english and scottish scarfs with Feyenoord fan Sjon from Gouda. One of them is the friendship scarf Everton-Liverpool : we will remember 15th April,1989....the day of the Hillsborough drama. Some of the other scarfs are special scarves regarding European Cup finals and FA Cup finals of Liverpool, Spurs, Arsenal, Everton and Manchester United in the period 1979-1981.Thanks to Sybrand Andringa I was able to add a FC Copenhagen scarf , a F.C. Utrecht Junior tigers scarf and a very old Spain country scarf to the collection besides some scarfs of German and French clubs.Last but not least collegue Said Ait Barghane gave me a Manchester United scarf from the years he studied in Manchester.Total number of scarfs end of January 2010 : 682. Just before the end of the year all photo's of the scarfs (628) in my collection sofar have been uploaded. Also some fan pictures are added in the photo gallery of the site. Germany, England, Scotland, Belgium, Netherlands, Russia, Ukraine, Venezuela, Greece, Ecuador, Czech, Croatia,Bulgaria,Poland, Brazil, Argentina, France, Spain, Portugal, Cyprus, Turkey , Mexico and Italy are represented now. In december I visited two matches with my brother in law Jan Smit in England ; Manchester United - Wolverhampton and Liverpool - Wigan. A very impressive experience especially the stadium tours and club musea. Before the Liverpool match I bought three scarves ; the match scarf Liverpool-Wigan, a 'This is Anfield' scarf and a friendship scarf : Liverpool-Celtic. Two special F.C. Twente scarfs have been added by Nick Oude Munnink , one of them is a friendship scarf : F.C. Twente - Schalke 04 , cupwinners 2001. Before the end of this month F.C. Utrecht fan Sybrand Andringa will enable me to add some dutch scarves to the collection.He will focus more on collecting items of his favorite clubs.This will result in 650 scarfs at the end of 2009, a milestone. The number of scarves 'uploaded' is 400 , which means another 220 to go.....A few changes will be made to the site in December. The main change will be that the country scarves will be shown on one page , so no need for a 'double click'. The goal is still to have the complete collection on the site at the end of December. Looking to the sites of other dutch collectors i saw the 'Scarf Collectors Holland' scarf , a limited edition of only 10 scarves.Thanks to Wouter Snall I was able to get number 7 and I am a member now of the 'Sjaal verzamelaars - Holland'. For links to the sites of the other members see under 'Links' , country Netherlands. Besides the collectors scarf Wouter offered some other scarfs which were difficult to refuse : Arges Pitesti , FC Nitra and an Ultra scarf from Braga. Last but not least : I bought last sunday at the FC Utrecht stadium, a 'Bunnik side' scarf , the FC Utrecht Ultra's. Have visited the football collectors fair in Houten the third of October. Not that many scarve collectors, the majority of the people were there for selling and buying Panini cards, books , programs and tickets. This was giving me the chance to buy the scarves which were for sale for reasonable prices.New scarves added to my collection bought at the fair : Beveren , Roeselare , Brussels , 1860 Munchen , Nottingham Forrest, Auxerre, Ireland, F.C. Twente , Academica and 1992 UEFA-Cup Final scarf Ajax - Torino. Two special scarves have been added to my collection this month. The Feyenoord Centennial scarf , a tribute to 'Het Legioen' , a gift from Feyenoord fan Fred Geldof and a memorial scarf for Henny van Schoonhoven(39) , 'De Tank' , old F.C. Utrecht player who died last month.This scarf is the first one of a set called 'helden van F.C. 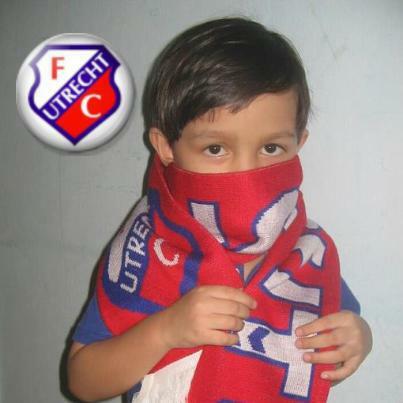 Utrecht' (Heroes of F.C. Utrecht) .At the end of october I visited with friends Wolter Meijer, Rob Porton and Peter van 't End Schalke-HSV. 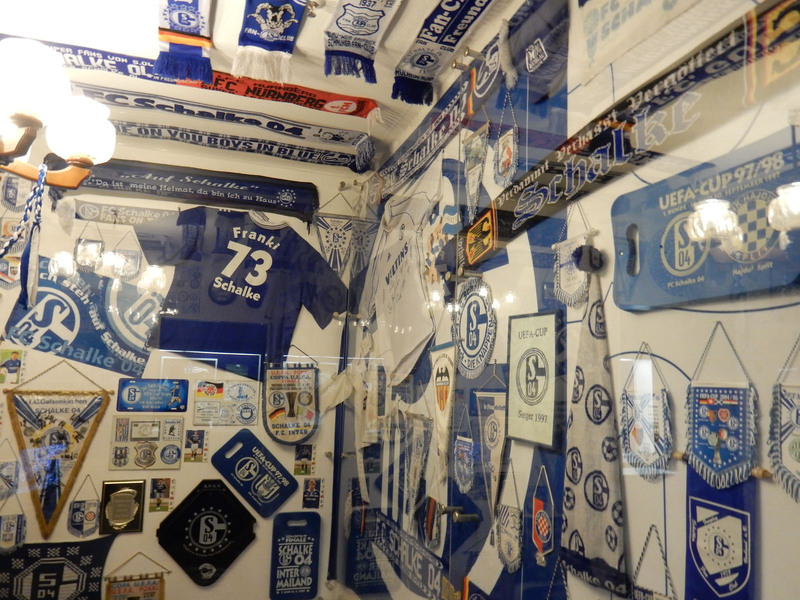 Good trip , good weather,good atmosphere and fantastic match(3-3), before the match we visited museum(see picture) and fanshop where I bought a Schalke scarf in scottish style. Great progress have been made with the site development. The first pictures are now on the site and the menu structure will be finalized within a couple of weeks. Just returned from holiday. We have made a journey through Italy by train and visited Milan, Venice , Florence, Pisa, Lucca ,Rome ,Naples and Sorrento. Italy is football crazy and at every place where a lot of tourists are shopping you can buy scarves. Most of the scarves are unofficial products and cheap. In the club stores (we visited the AS Roma store)prices are much higher, not only for scarves but also for shirts. 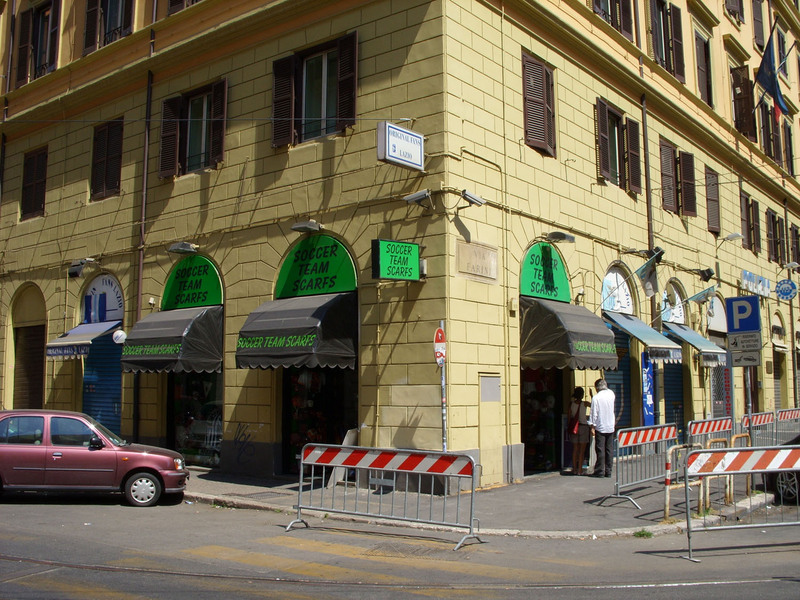 In Rome there is also a shop specialized in scarves. It is called STS , Soccer Team Scarves and located near the Lazio fan store, near train station Termini. Besides scarves from different clubs from different countries they have the complete serie A , B and C in stock and a lot of country scarves. New scarves added to my collection : Nurnberg (Bundesliga complete now), Croatia, Ivory Coast , Peru, Red Star Belgrade, Osasuna, Villareal, FC Basel , Celtic-Sankt Pauli friendship scarf, Uruguay, Brescia, Lecce, Bari, Atalanta, Messina, Cagliari, Catania, Chievo, Palermo, Venezia, Livorno, Siena, Reggina, Fiorentina, Pisa, Empoli, Torino and Sorrento.